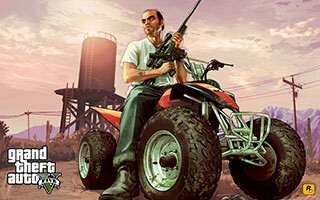 While not a new, Rockstar have released the Trevor ATV artwork as a downloadable wallpaper in a multitude of different resolutions for different devices. We originally saw this during the media blowout a couple of weeks ago. 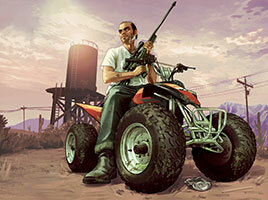 We must admit, this cropped version of the artwork might strike you as a little awkward when compared to the original piece as it cuts of the tip of the barrel of the gun Trevor is holding, as well as the bottom of the ATV's wheels. That said, the artwork is now in a much higher resolution that is suitable for desktop wallpapers. Check it out below. 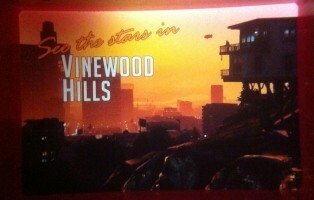 This, and the original uncropped version of this artwork can be found on our GTA V artwork page. 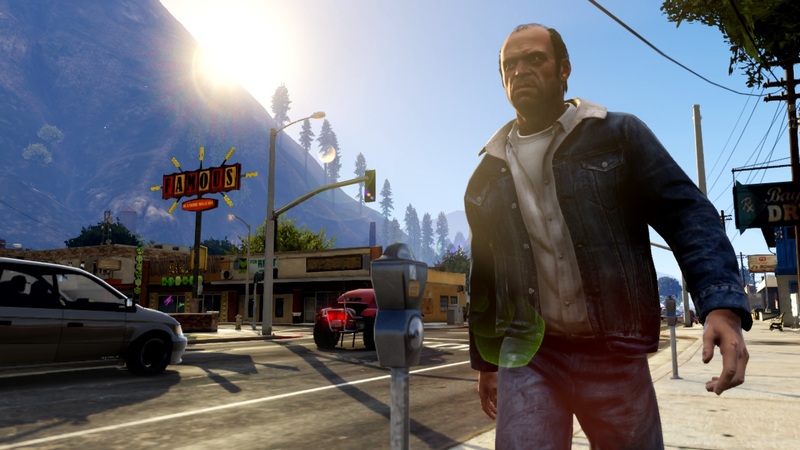 Meet Trevor Phillips, the unhinged, unpredictable, psychopathic career criminal and drug addict that you will play as one of the three main protagonists in Grand Theft Auto V this spring. Rockstar have just released a special trailer for�GTA: Vice City 10th Anniversary Edition, the special touch-screen optimised edition of the game coming to various iOS and Android devices next week. Rockstar have just announced via Twitter that a special trailer for the 10th Anniversary Edition of GTA: Vice City will be released tomorrow (29th November) at 12:00 EST (17:00 GMT in the UK / 04:00 EDT the next day for unlucky Australians!). The special edition of the game is being released on various mobile devices running iOS and Android next week on the 6th December. You can read our news article from last week for more details on that. Check back here tomorrow at the time given above where we'll have the trailer up and ready for your fantastic critique. 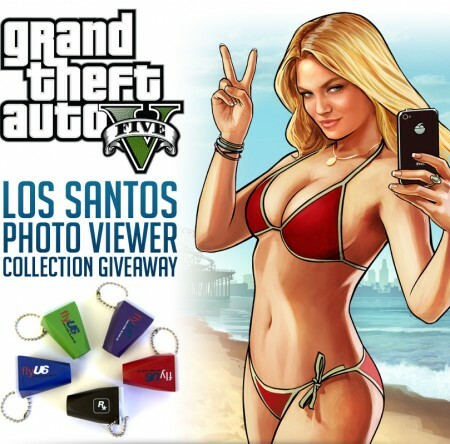 Just a heads for everyone who loves collecting GTA memorabilia, Rockstar are holding a competition on their Facebook page where you have a chance to win one of 50 GTA V photo viewers featuring a scene from Los Santos. 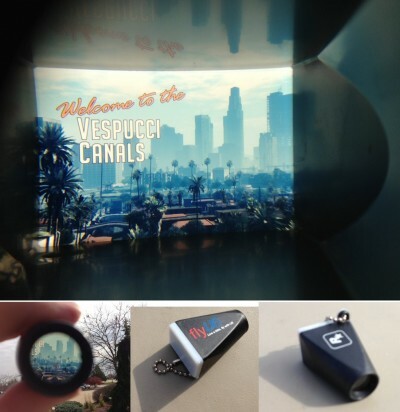 These are the same photo viewers that were given out as pre-order bonuses at various stores in the U.S. This competition reaches not just the U.S. but also (some) other countries, states and provinces - full eligibility details can be seen on the competition entry page, so make sure your place of residence is listed and that you're over 18 years of age. Patrick Brown is up to his old tricks again, creating more incredible fan artwork. Now that we've had a lot of media for Grand Theft Auto V, Patrick has taken the time to draw his first piece for the game. Check it out in full below! You can see the full resolution on Patrick's DeviantArt account, along with countless other fantastic artworks. 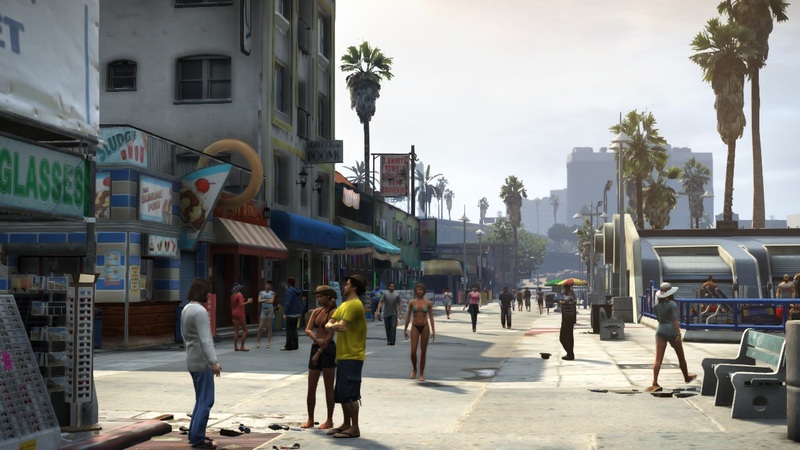 With the onslaught of GTA V media and information coming to a stop for the time being, Rockstar can now focus their promotional efforts on the 10th Anniversary Edition of Grand Theft Auto: Vice City for iOS and Android. 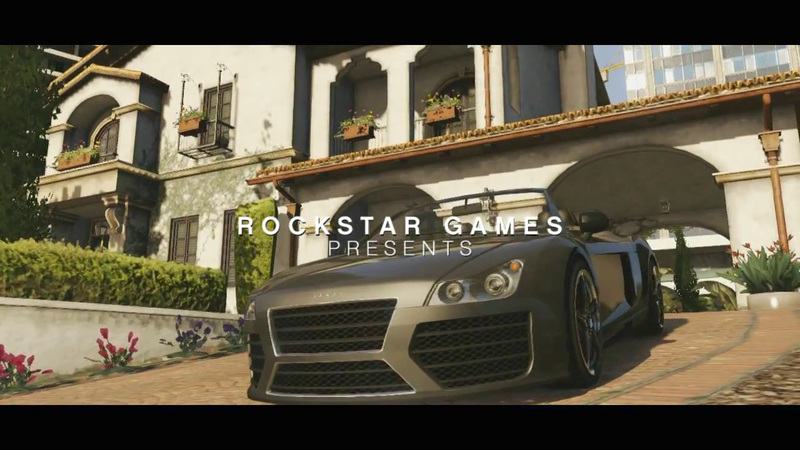 Today, Rockstar announced that the game will be released on the 6th December to the App Store and Google Play, for a multitude of different devices (list at the end of the post). Both versions will be priced at .99 (�2.99 / �4,49). 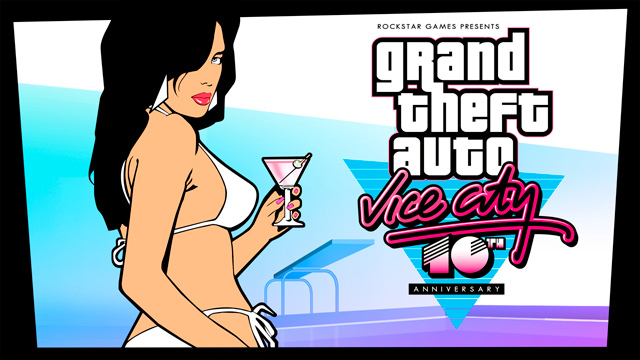 Within the next couple of weeks Rockstar promise to release a new trailer as well as limited edition Vice City anniversary-themed collectibles on the Rockstar Warehouse, so stay tuned for updates on those. Below is a list of all compatible devices. 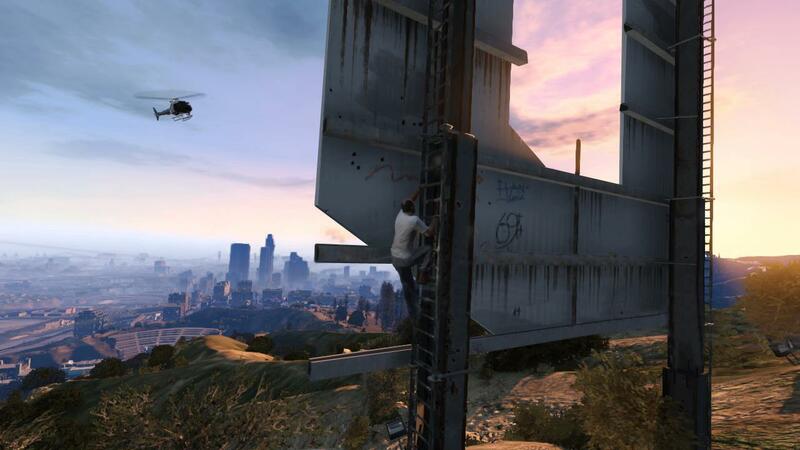 Microsoft's official Xbox Facebook page has released two new Grand Theft Auto V screenshots today. Not entirely new ones, but from a different angle than we've seen previously. The first shot has been seen before from this angle, while the second was previously seen from here. 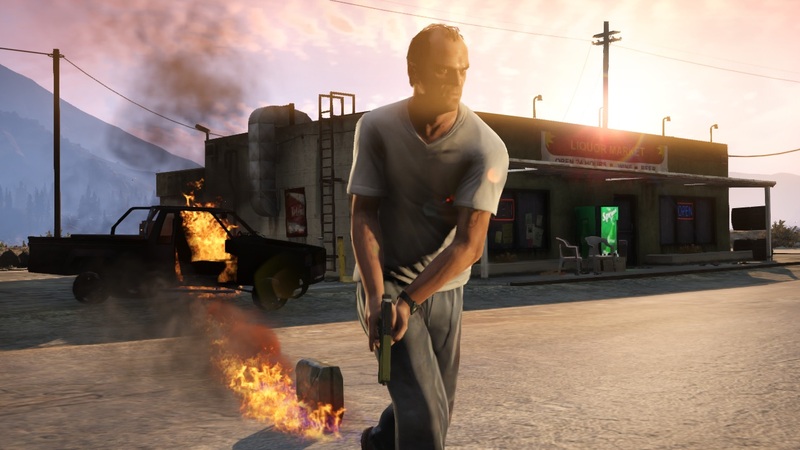 Grand Theft Auto: Vice City has been removed from Steam as of earlier this morning. 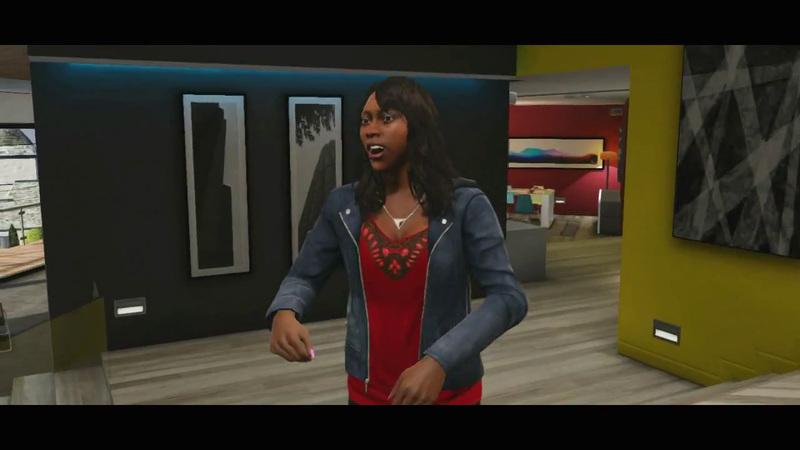 The removal rose from a conflict between Rockstar Games and Sony Music Entertainment pertaining to a licensing issue for Michael Jackson�s "Wanna Be Startin� Something". Users that have already purchased the game on Steam can still download and play it, but if you want to buy it you're going to need to wait until the two companies resolve their problems. Needless to say, we'll keep you updated on this story. What do you think of the situation? Did the RIAA go too far here? Are they in the right doing this? 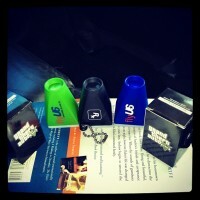 Let us know in the forums. 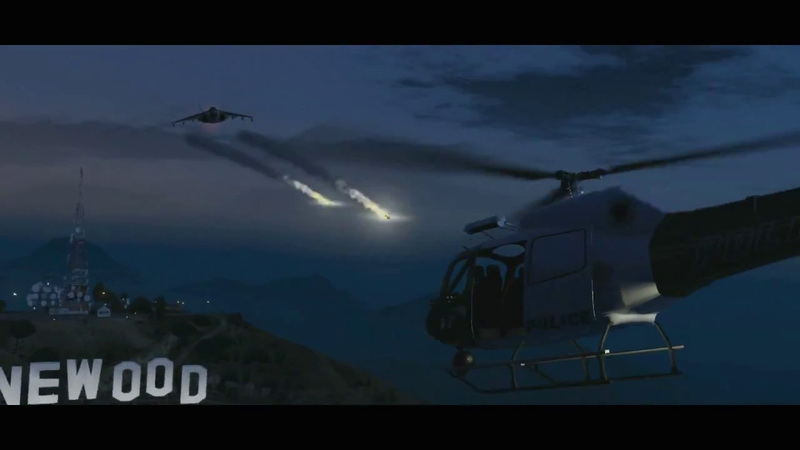 We hope you enjoyed the epic second trailer for GTA V released earlier today. Here's our thoughts and analysis of what we saw. 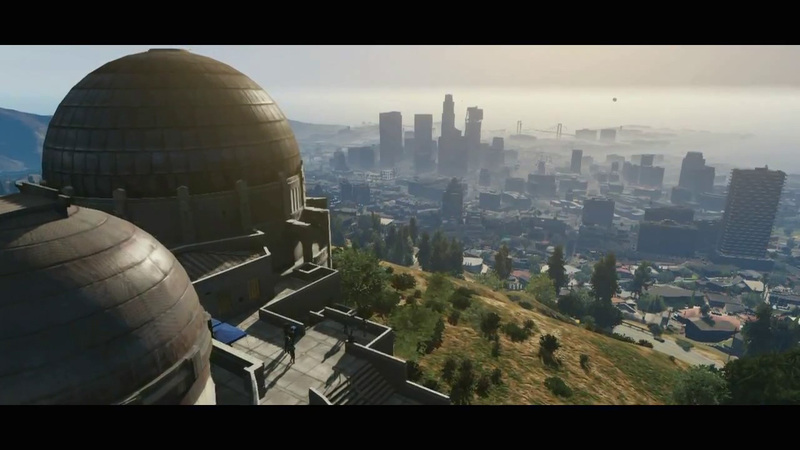 Screenshot #1: On whatever platform Rockstar is using, the draw distance is truly amazing. You can see the whole city from this mountain side view. 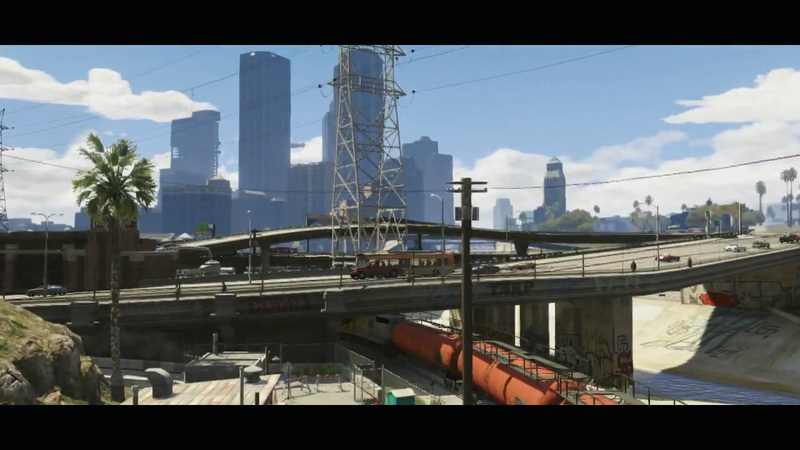 Screenshot #2: We can see a tennis court (side activity?) 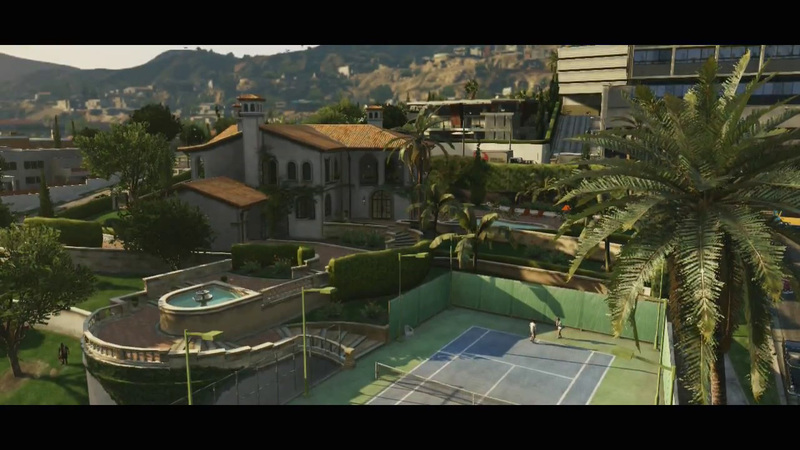 and all of Michael�s mansion, on the left of the tennis court, we can see a man using a leaf blower. 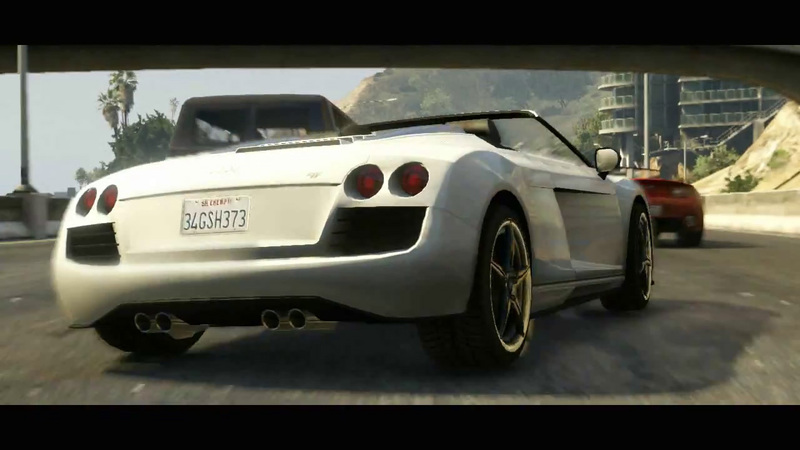 Screenshot #3: We can see some different types of vegetation along the driveway, along with a car that looks a bit like the Audi R8 Spyder. 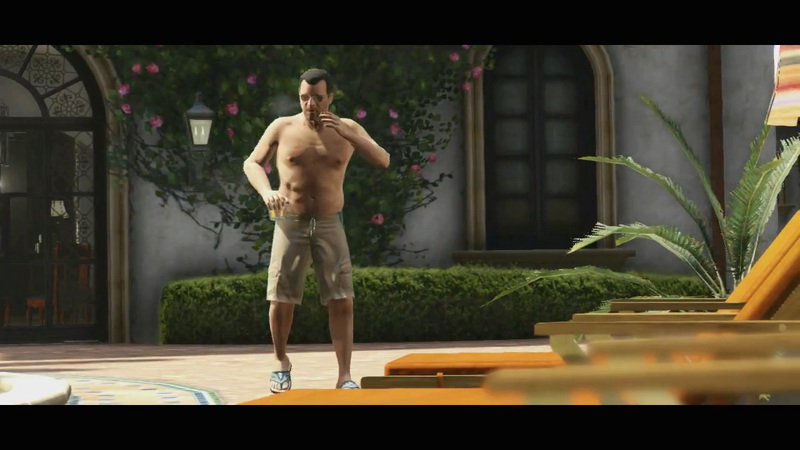 Screenshot #4:We can see Michael�s (at least somewhat) promiscuous daughter that has a tramp stamp and a below the neck tattoo of some sort. We can also see Michael�s wife in some tennis clothing. They are both arguing about having a male sleep over the house. 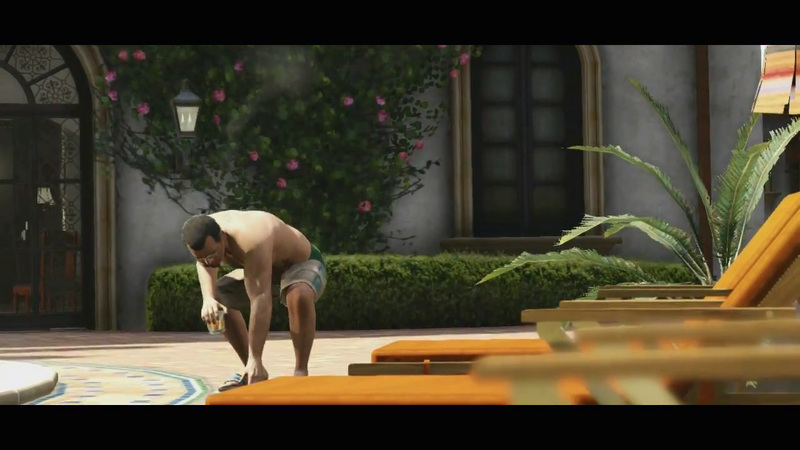 Screenshot #5:We can see Michael holding a drink and smoking a cigar. 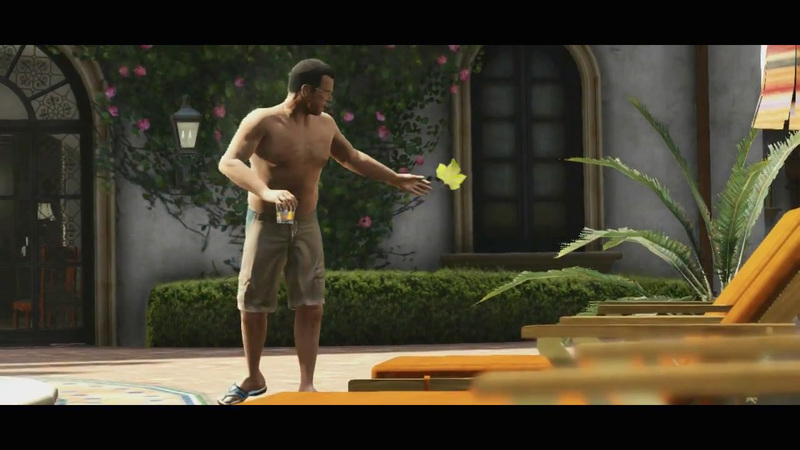 Screenshots #6 & #7: We can see Michael picking up a leaf and throwing it to get it away from the pool. This shows that Michael cares about his property very much, and probably thinks that the landscaper we saw earlier is doing a subpar job. 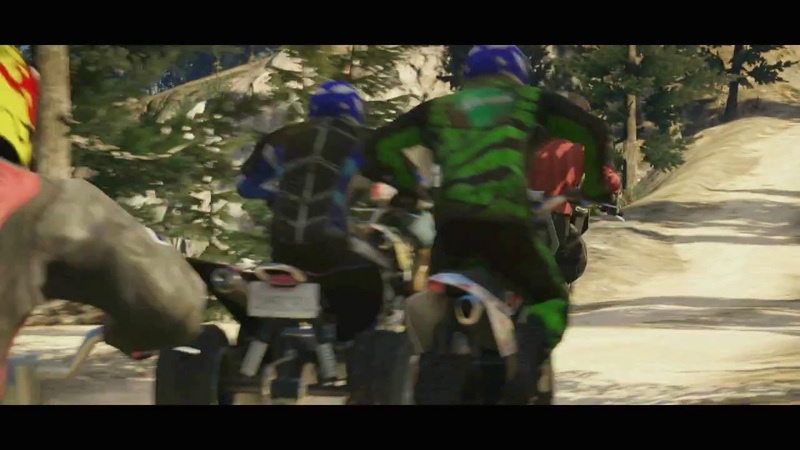 Screenshots #10 & #11: We can see a Mesa Grande, Sabre GT/Sabre, and possibly a Cheetah. 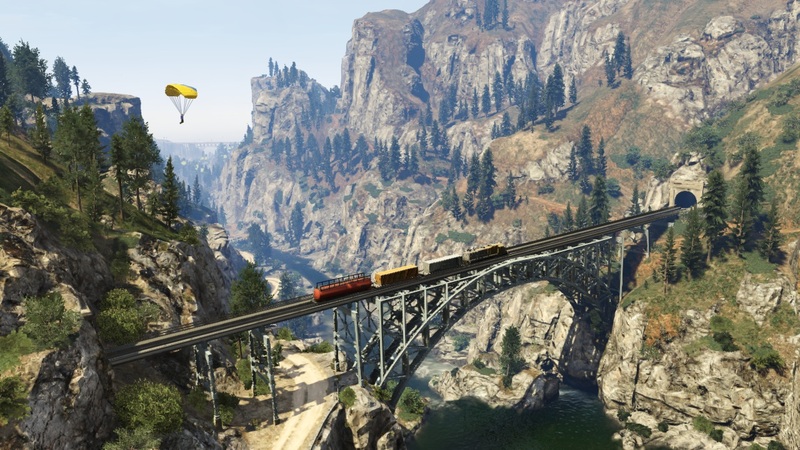 In the underpass we can see a train passing by, it�s brakes squealing as it comes to a stop. Next to the train we can see some water flowing. 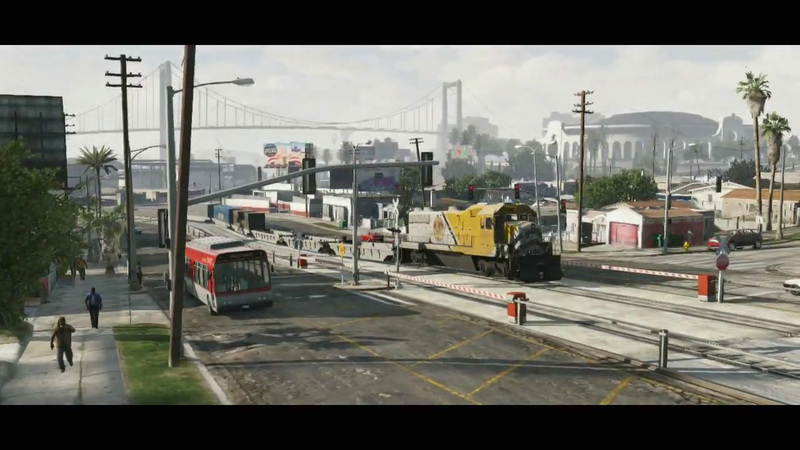 Screenshot #12:We can see a very big difference in the type of vehicles in this area compared to the city area. We mostly just see 18-wheeler trucks (hopefully detachable backs). 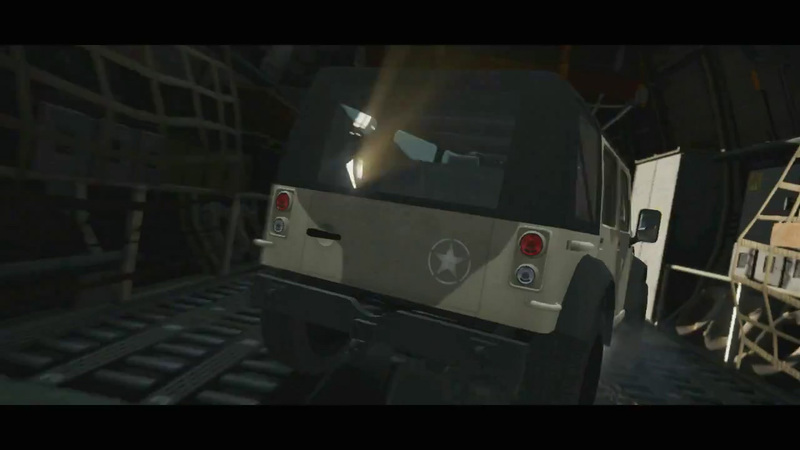 Maybe trucking missions will make a return? Along with the trucks, we can see some windmills and satellite dishes in the background. They seem to appear a lot in the desert area. 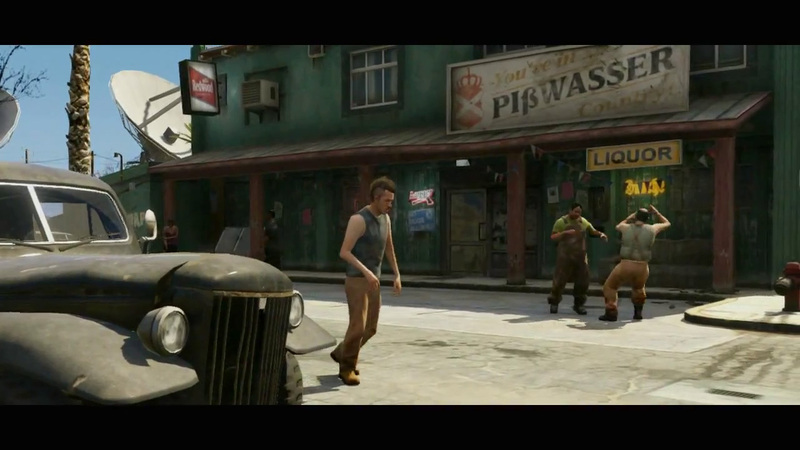 Screenshots #13 & #14: We can see an intoxicated man struggling to walk, a brawl going on, and a car that looks like a Tornado driving by in front of a bar. We can see our favorite brands return, such as Redwood cigarettes and Pibwasser beer. Screenshot #15: We can hear Trevor yelling in the background about crank, which is a very strong type of Methamphetamine very popular in the midwestern states. Crank is used a lot by truckers to stay awake during their long journeys. 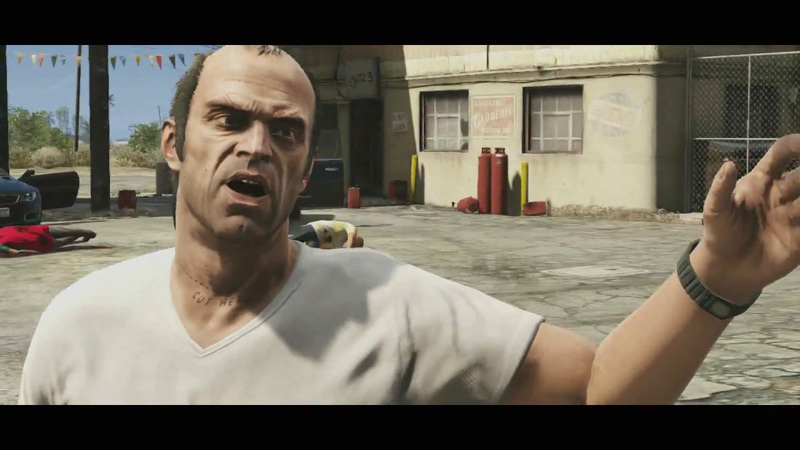 We can see that Trevor is holding some sort of gun. We also see a trailer in the background sinking in water, most likely caused by some sort of flood or an earthquake (earthquakes happen frequently in California). 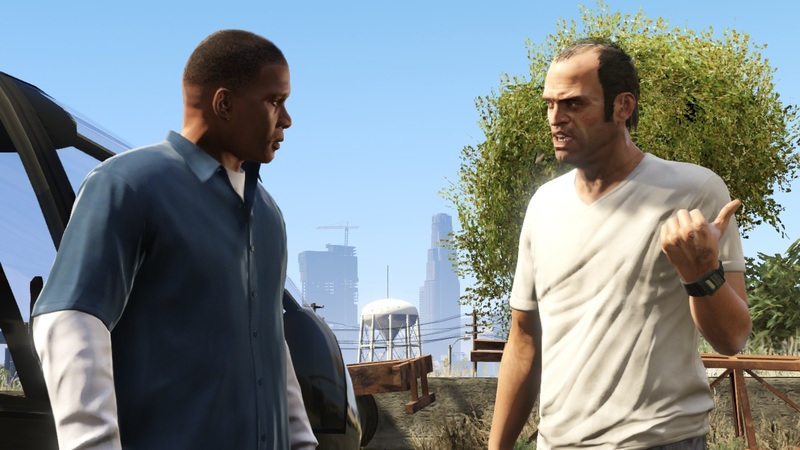 It is also suggested that Trevor's last name is Phillips, since he mentions "Trevor Phillips Enterprises". 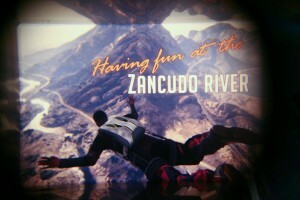 Screenshot #16: We can see an aquarium in the background that is not filled with water. 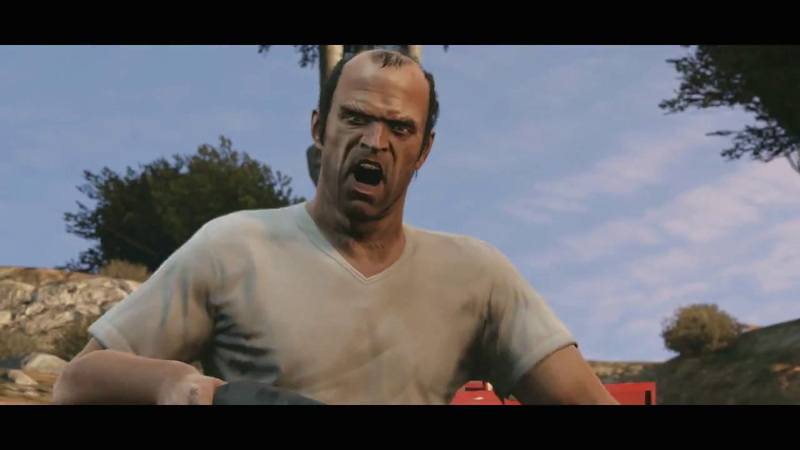 Trevor looks like he�s about to smash a man�s head into the wood. 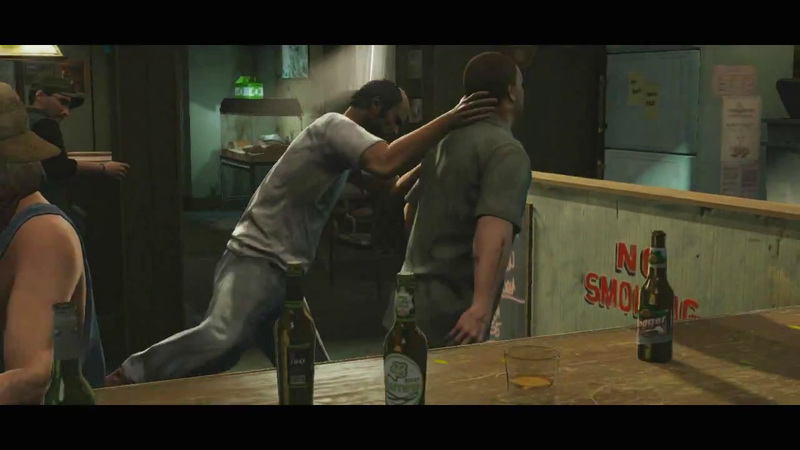 Screenshot #17: Trevor smashes a man�s head into the wood. 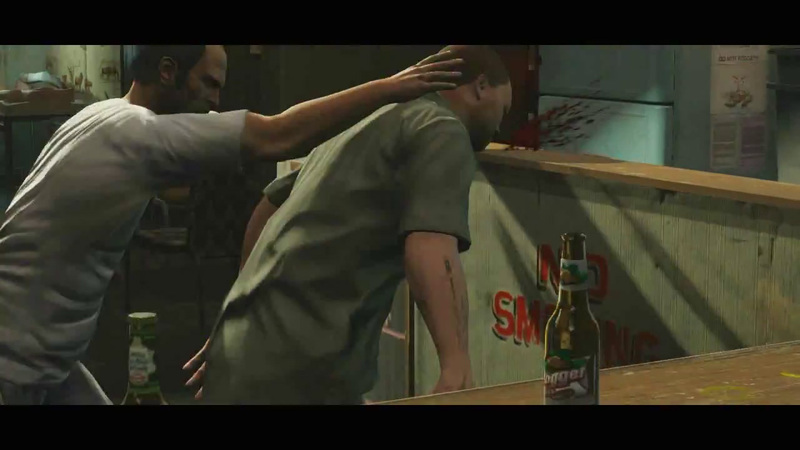 Screenshot #18: Possible tattoo of a pot leaf on Trevor�s hand. Look�s like he�s holding a gun, most likely a sawed off shotgun. Screenshot #19: We can see the Bandito makes a return. 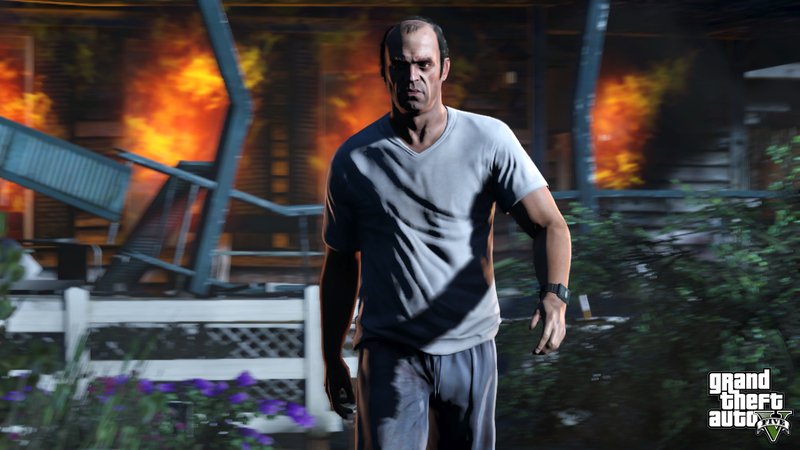 Screenshot #21: We can see a very angry Trevor throwing a Molotov cocktail. 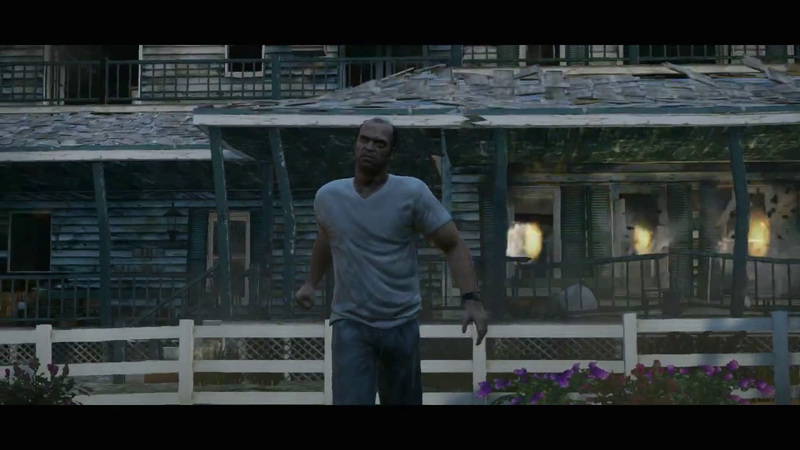 We also see some sort of purple vegetation on the left, probably different than the earlier screenshots. Maybe some sort of plant picking similar to Red Dead Redemption? 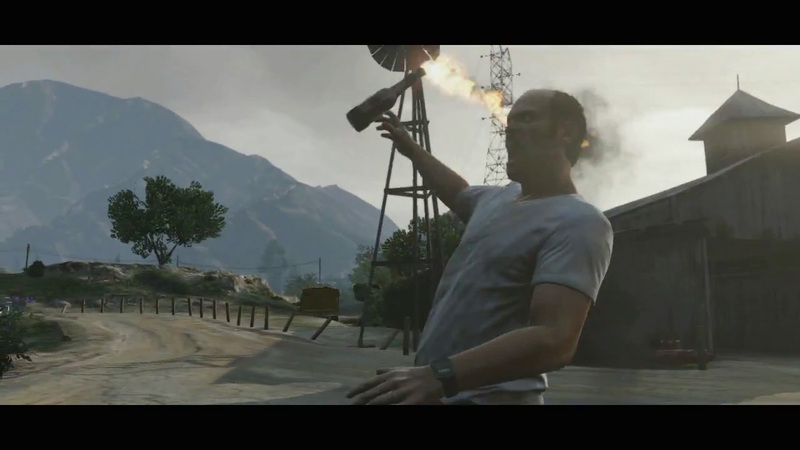 Screenshot #22: We can see a trail of fire rising from the Molotov cocktail that Trevor threw. 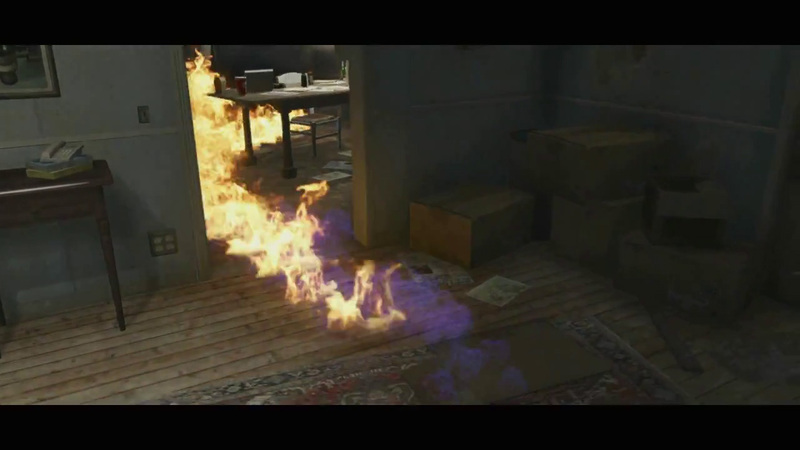 Either that�s really, really dry wood or Trevor poured some gasoline in the house first. Screenshot #28: We can see dead bodies and gas tanks in the background. 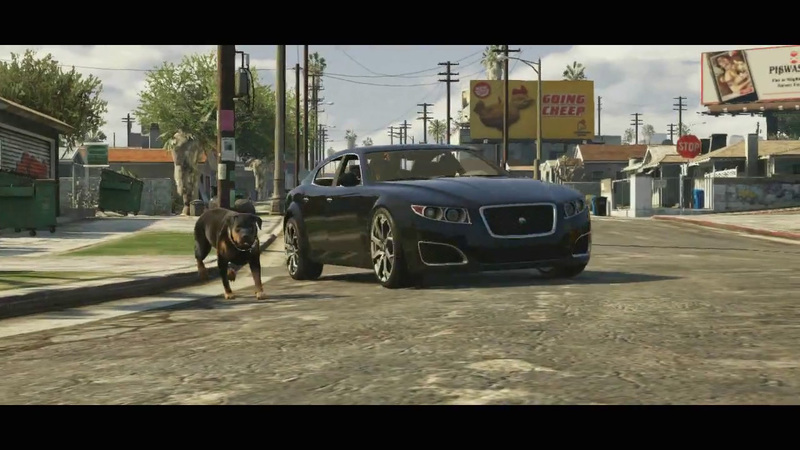 Screenshot #29: An SUV in the background and a BMW looking car. 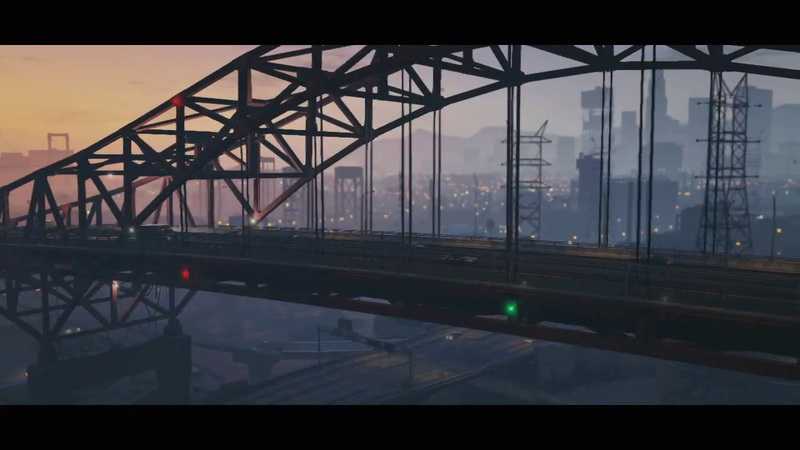 Screenshot #30: One of the main San Francisco bridges is shown. 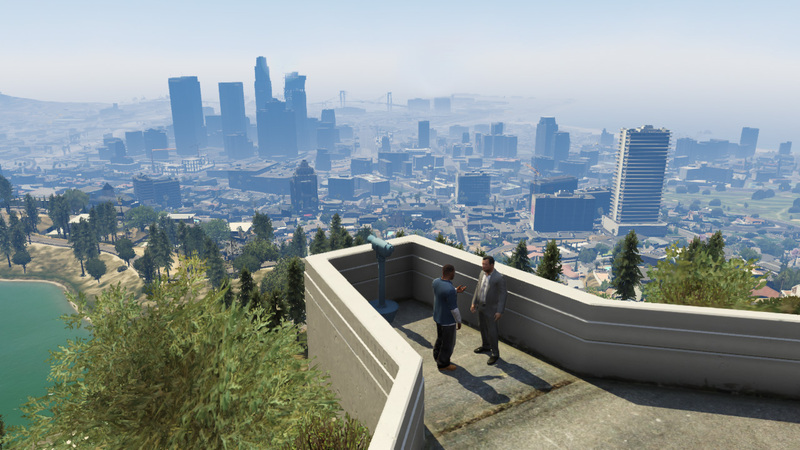 Screenshot #31: We see part of San Francisco here, doesn�t that dome in the background look familiar? Also, check out how much the busses have changed... I bet we�ll be able to walk around on them and get on and off at bus stops. 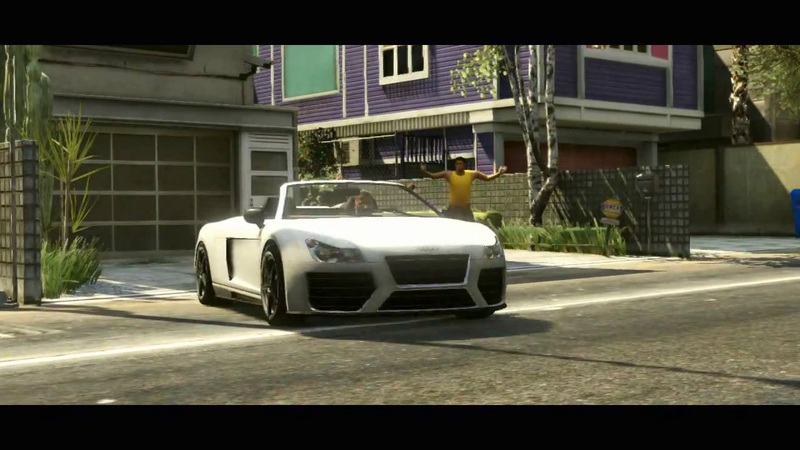 Screenshot #35: We see another type of Audi vehicle, maybe the same as the one before, being driven off by Franklin. 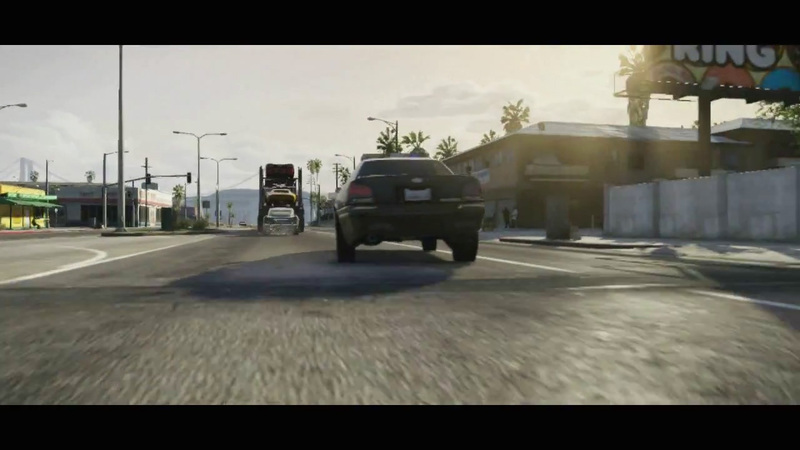 Screenshot #36: We can see the license plate says "SA Exempt". California has the license plate "CA Exempt" to denote government vehicles. 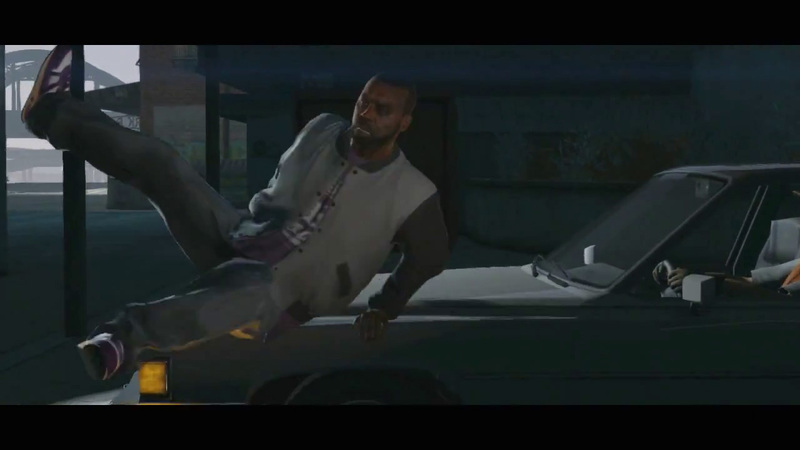 This would imply that Franklin is stealing a government issued vehicle. Screenshot #37: Some sort of race or getaway is going on? 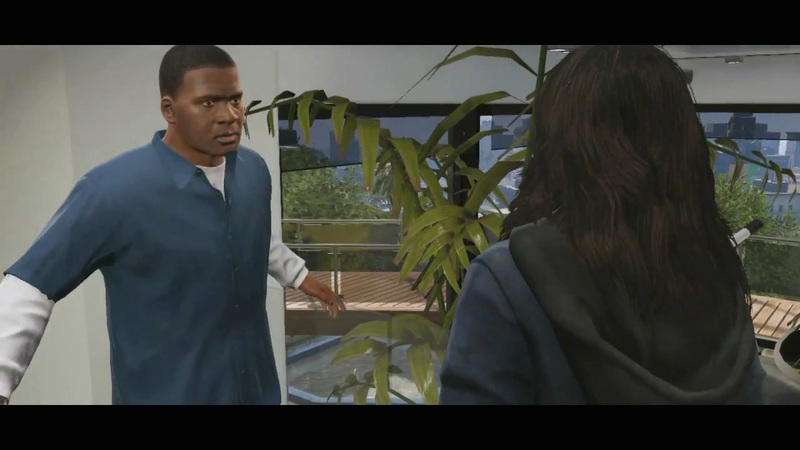 Screenshot #42: We can see the interior of Franklin�s home, and possibly his girlfriend or sister in the scene as well. Screenshot #43: A closer look at his sister/girlfriend. 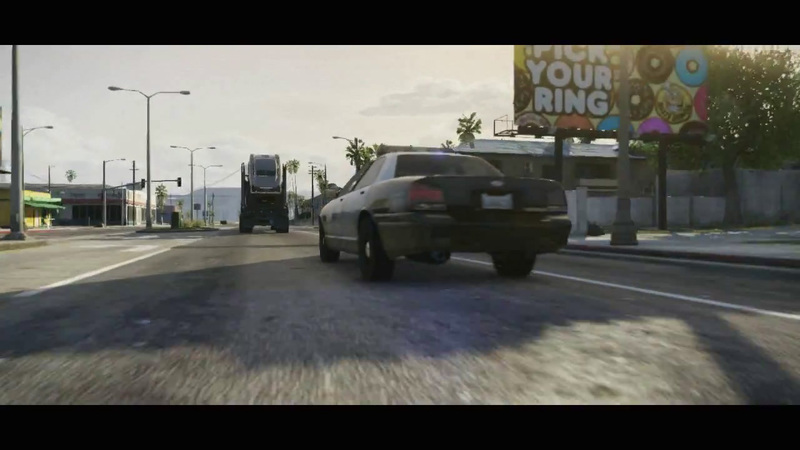 Screenshot #44: Police follow a truck that is filled with cars (Franklin is most likely driving). Screenshot #45: Seems like the back can be controlled to drop cars off in situations like this to distract your opponent. 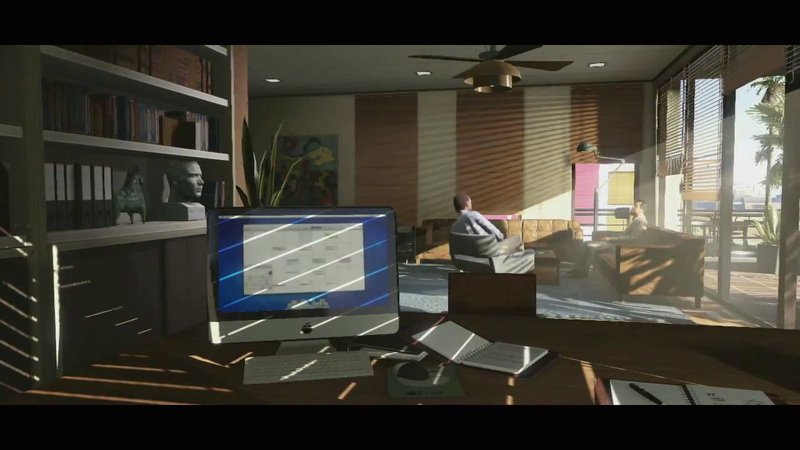 Screenshot #55: Rockstar's own "Apple" computer is shown (called "Fruit"). We also see Michael talking to someone, most likely a psychologist or psychiatrist about his son, James. 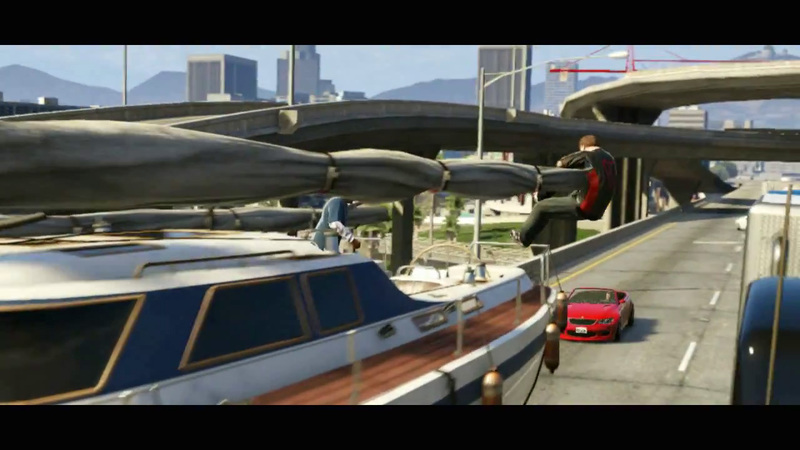 Screenshot #57: We see someone hanging on to the sail of a boat, most likely his son James. 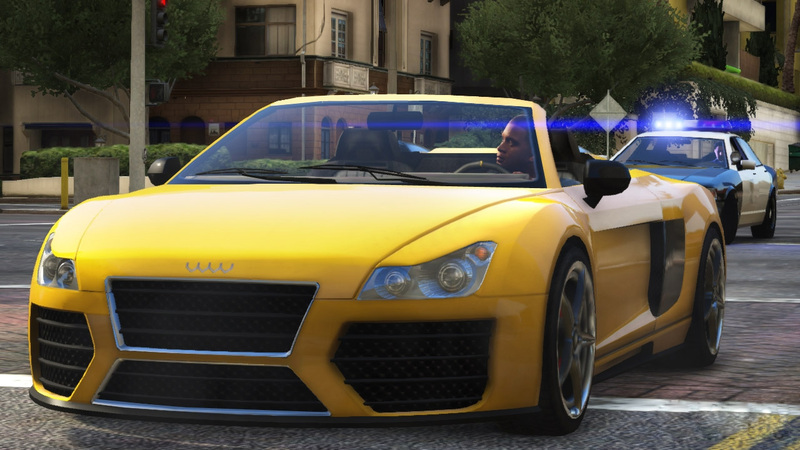 Screenshot #62: If you look at the license plate, it says San Andreas and not Los Santos. 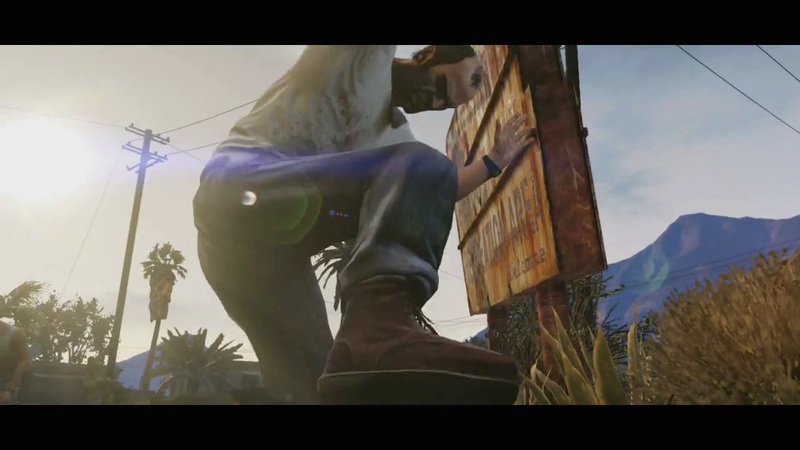 Screenshot #66: We see Michael�s son, James, all tatted up, talking about �bouncing�. We can observe that Michael does not like when his son uses the term �bounce�. 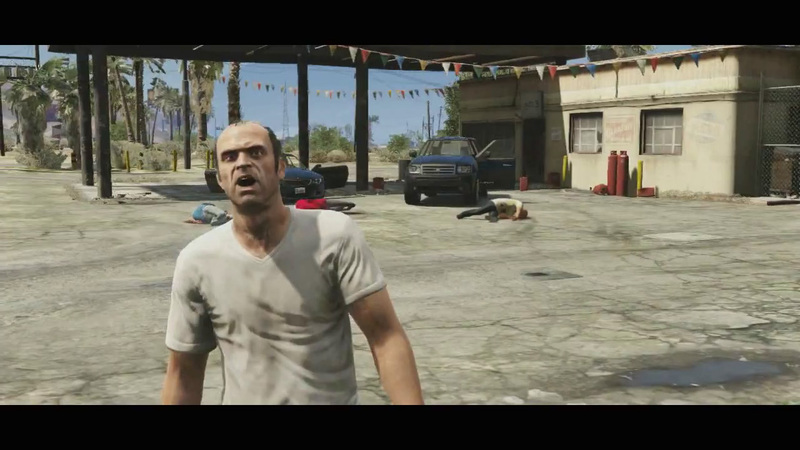 Screenshot #67: We see Trevor kicking someone�s face in. Screenshot #70: Maybe a new plane, or a Beagle? Screenshot #72: An absolutely stunning shot of the mountains we�ll be able to see, and hopefully play on. 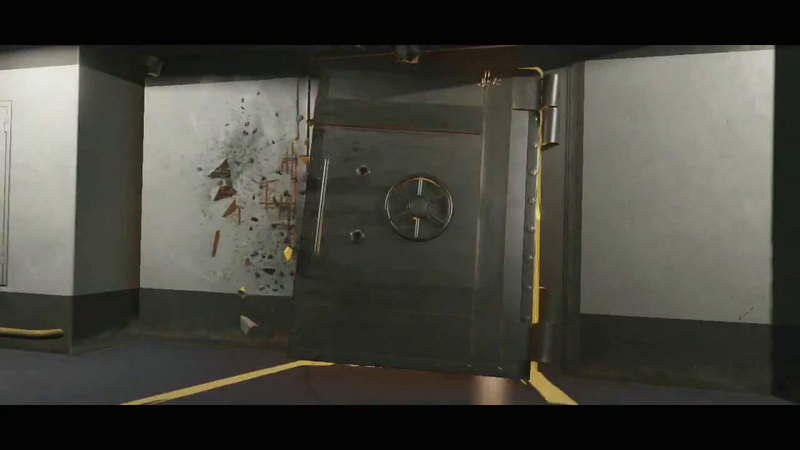 Screenshot #73: A safe is being blown out of the wall, most likely in a bank. 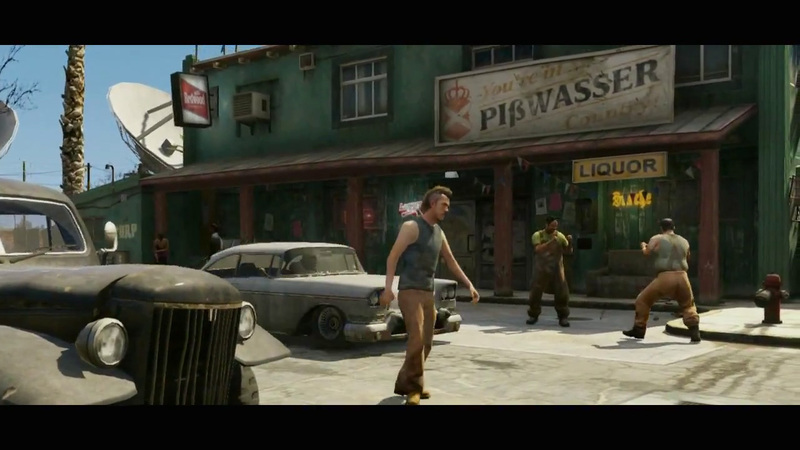 Screenshot #76: Some robbers holding assault rifles. 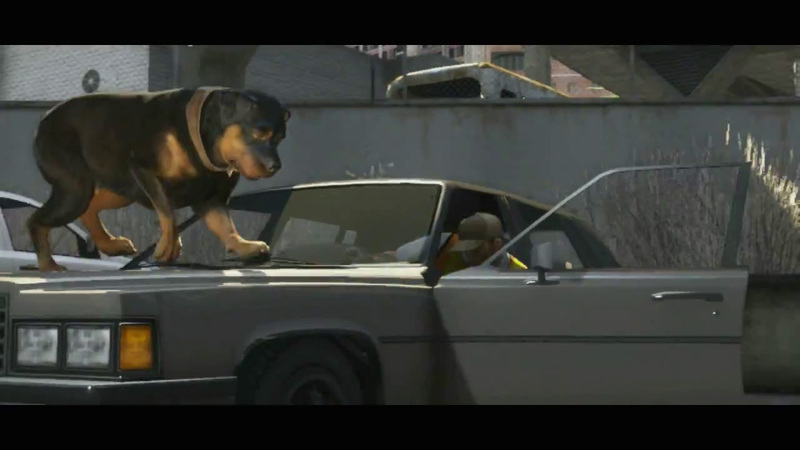 Screenshot #78: Dogs (rotweiller)! Cars! CLUCKIN� BELL?! Screenshot #79: If we look on the street pole we can see some postings. One looks like a missing person or missing pet poster. Maybe we can do these as side missions? 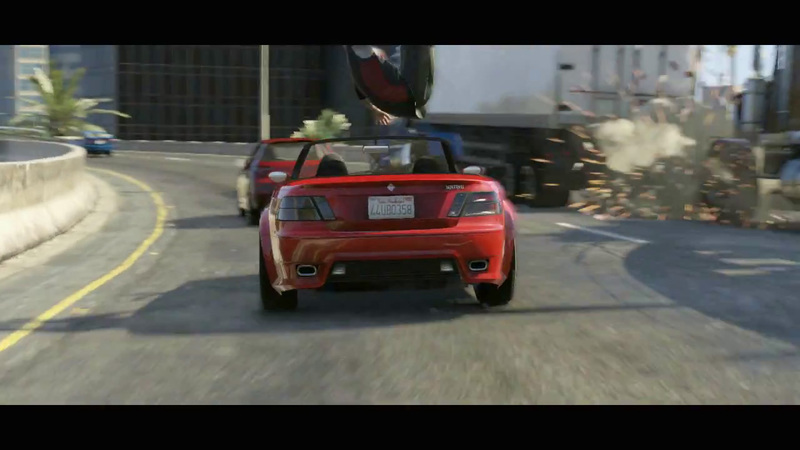 Screenshot #81: Franklin hops over a car. 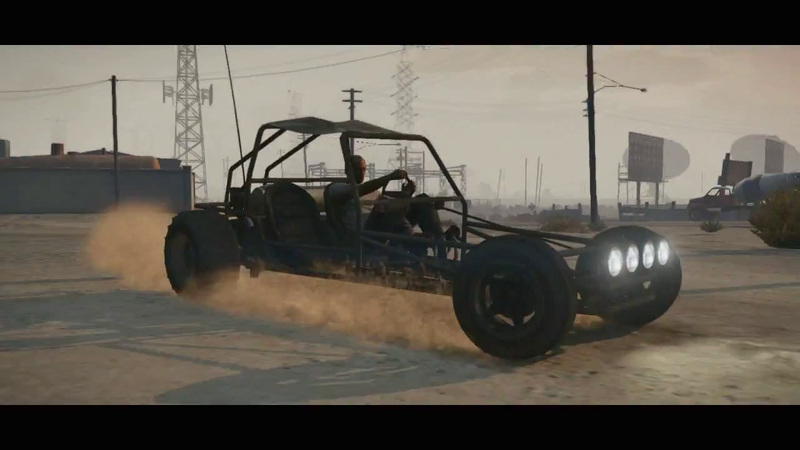 Maybe we�ll be able to hop over cars like this in free roam? 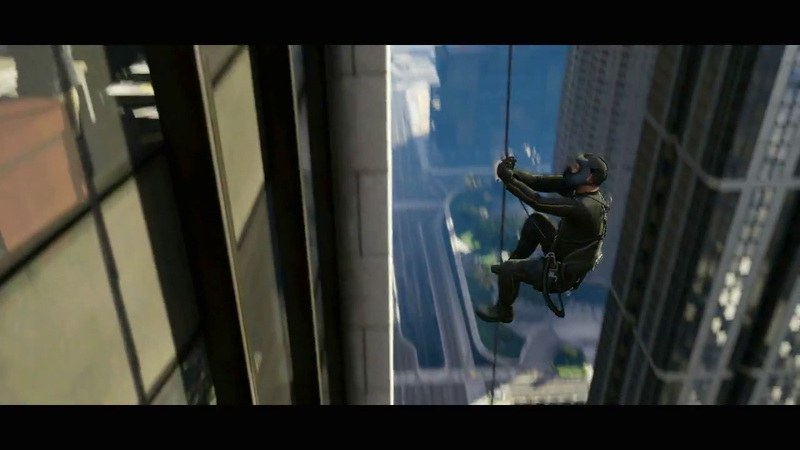 Screenshot #83: Michael rappels down a building. 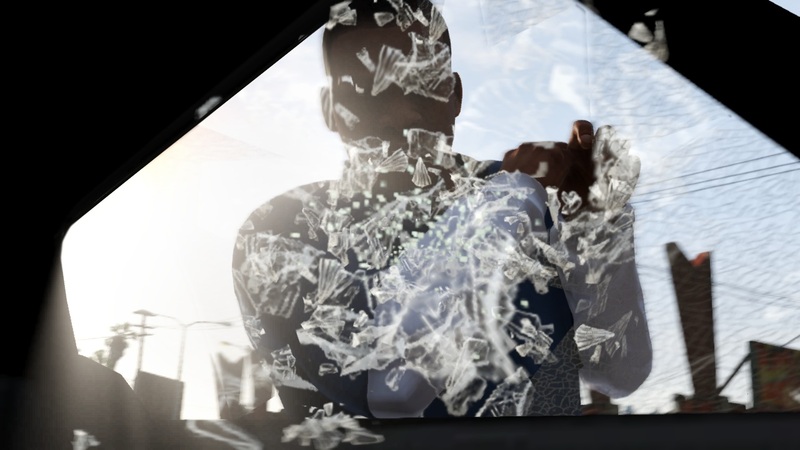 Screenshot #85: A man disguised as a Bugstar employee (most likely a pest removal service) wearing a gas mask and using his gun to smash some glass. And yeah, I tried calling 999-BUGSTAR and it�s a non-working number. 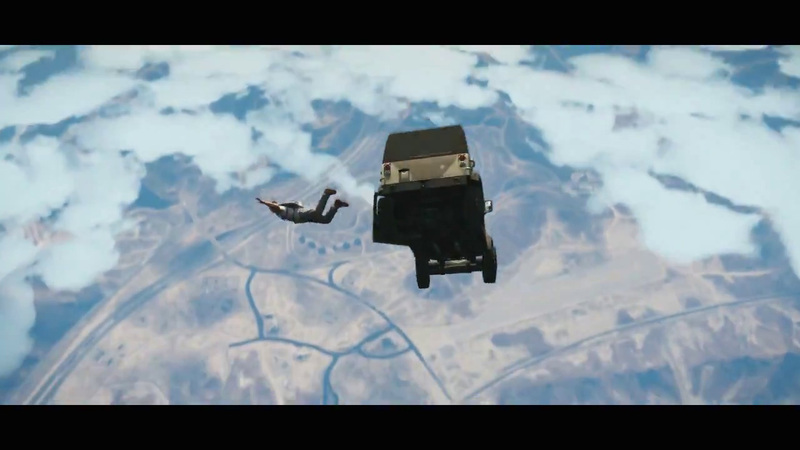 Screenshot #87: We see the name of three of the roads, Sel Perro Fwy, Elipse Blvd, and Bay City Ave.
Screenshot #88: Some sort of military issued Jeep falling out of a plane. 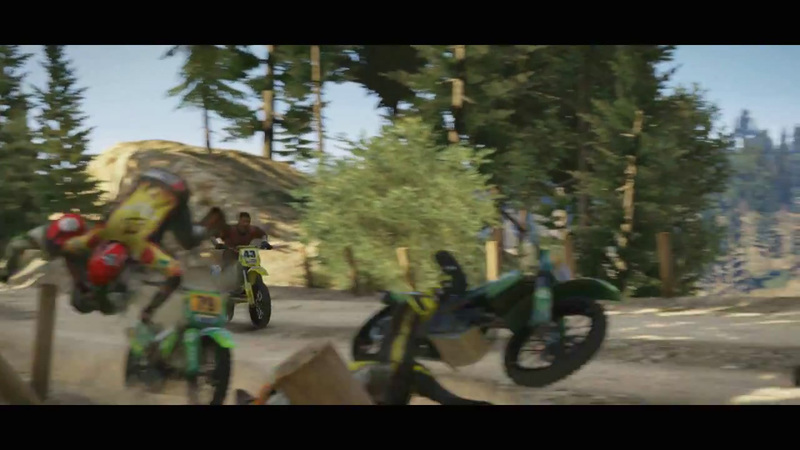 Screenshot #93: We see some guys racing on Quad�s and Sanchez�s, in full offroad racing gear. Maybe we can wear this outfit as we wish. Screenshot #95: A big collision in the race. 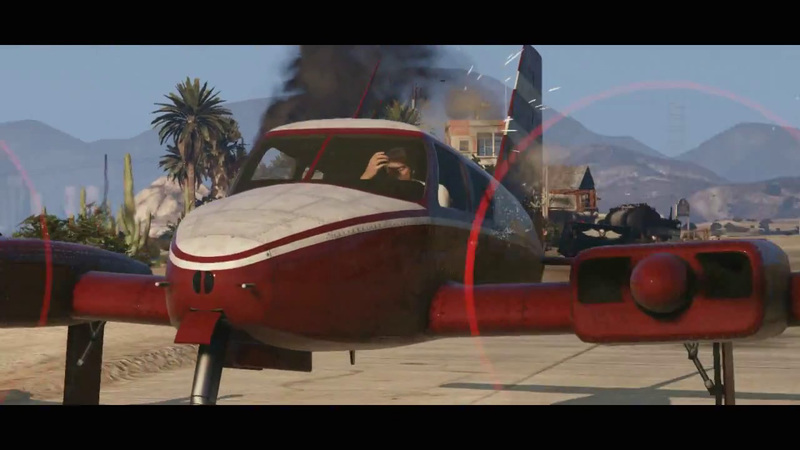 Screenshot #102: Looks like a Buzzard attack helicopter, previously seen in The Ballad of Gay Tony. 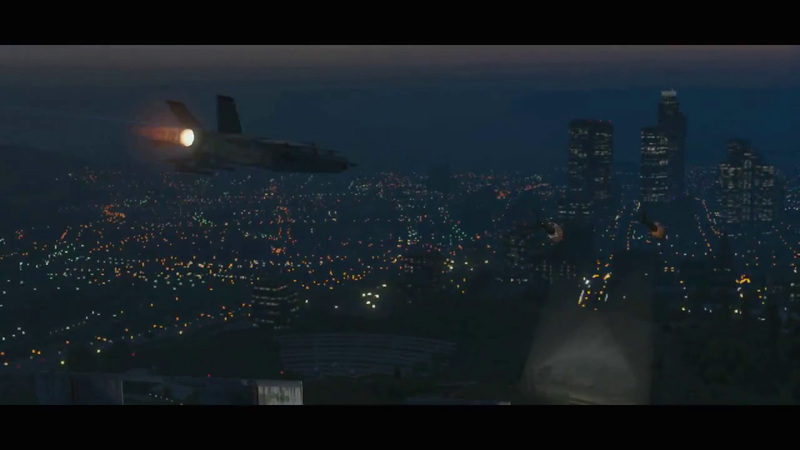 Screenshot #103: A military jet, most likely a Hydra. 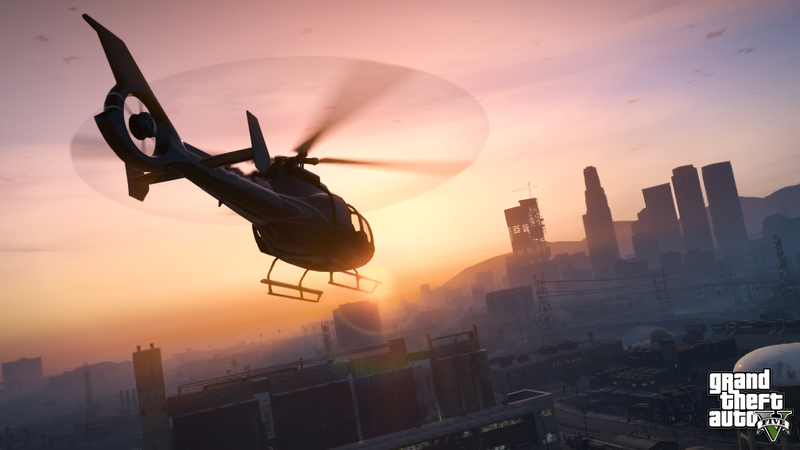 Screenshot #105: A police helicopter, probably the new Police Maverick. Thanks for reading, hope you enjoyed what we have! If you see any errors or have any suggestions, please post in the forums and let us know! Following on from the trailer excitement we have some more media, this time in the form of three new screenshots! Check them out. 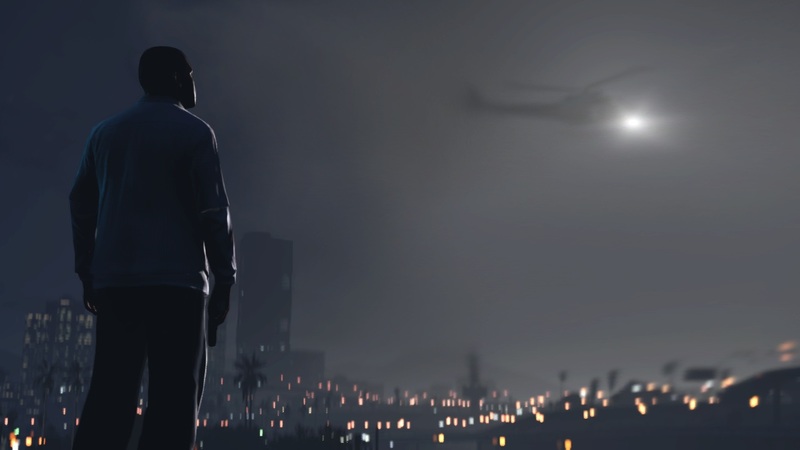 You can see all the GTA V screenshots currently available in our gallery. 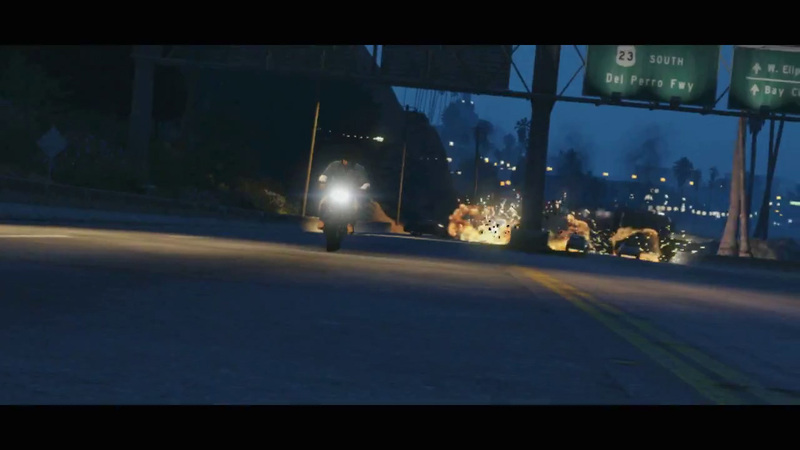 And if you missed them, we uploaded 112 screenshots from trailer 2.
if you're having trouble viewing the embed above. We'll have a full summary of the trailer here in a little while. Keep checking back! 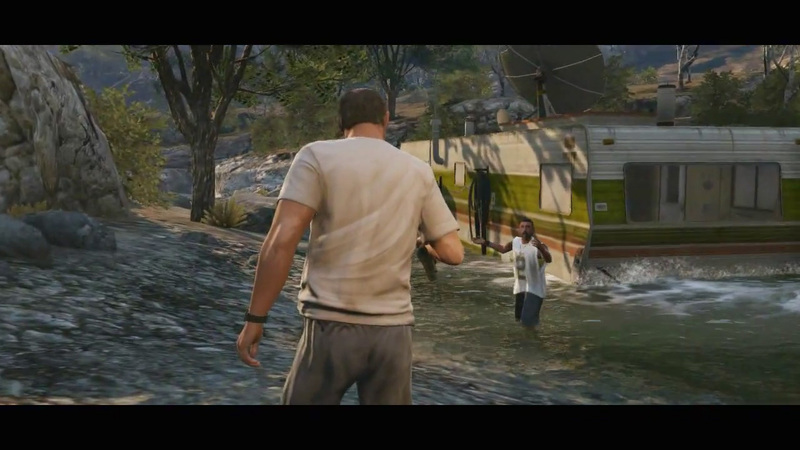 UPDATE: I've uploaded 112 screenshots from the second trailer. And for those wondering, the song featured in the trailer is Stevie Wonder's "Skeletons". Next up, IGN's interview with Les Benzies. The interview is a good read and includes a few details on certain things in GTA V. We've picked out a few interesting quotes below, but we certainly recommend reading the whole thing. 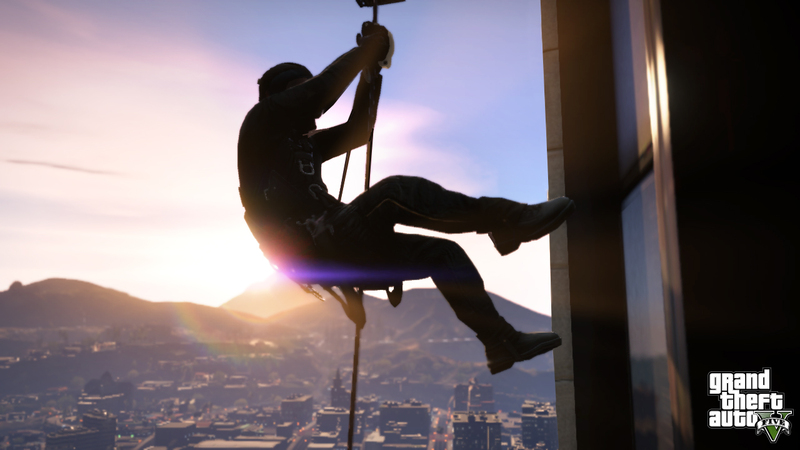 "We do have a bunch of missions in GTA V that are far more freeform than anything we have done before," he continues. "We tell you to go get something and the player decides how to do it - what characters they need on the job and what tools they need for those characters." 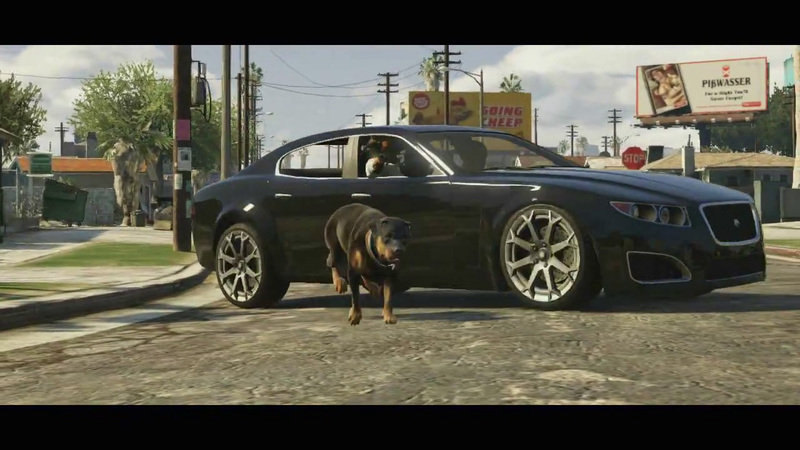 you can expect to see dogs guarding areas and causing the player trouble when they try to sneak past them. 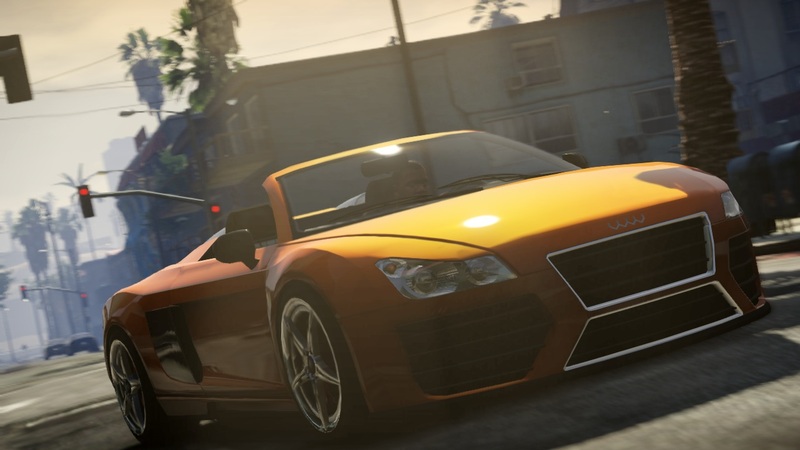 If the player wants to get their hands on one of the more 'high end' vehicles early in the game they'll have to work for it. For instance, airport security won't let you just wander in and steal a jet, they'll give you some serious opposition. Refining open world multiplayer into something really special has been a huge focus of development and we are very excited to share more information with people soon. 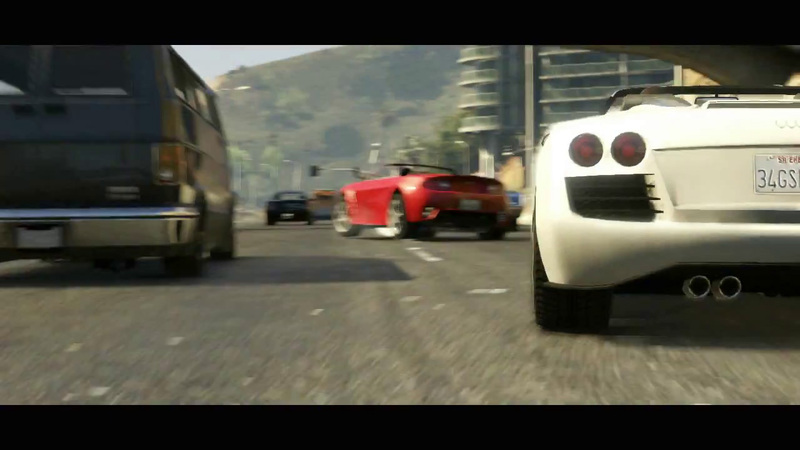 on the multiplayer side we hope that GTA V will do for multiplayer open world games what GTA 3 did for open world single-player games. Lastly, we have IGN's Meet the Cast article which sheds a bit more light on the three main characters. We'll be updating our own characters page shortly to reflect the new details. 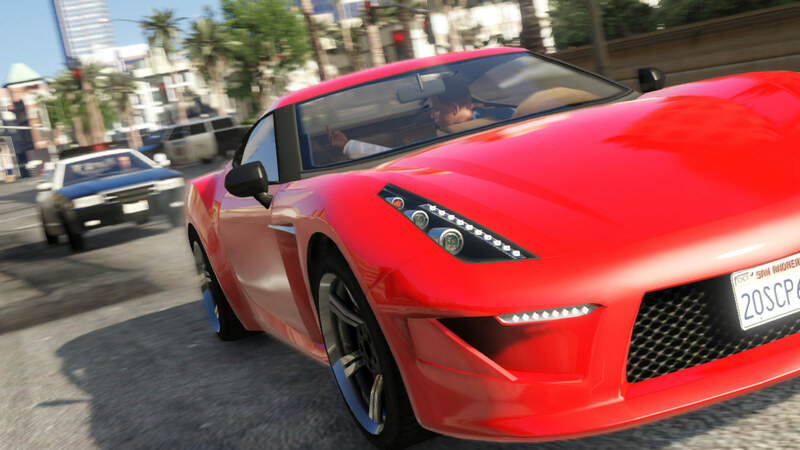 IGN have posted their first GTA V preview�up, if you've read our article earlier today�then none of the information will be new to you, however you will be interested in the fact that they will be posting two exclusive new screenshots every day this week. The first of which are posted below. 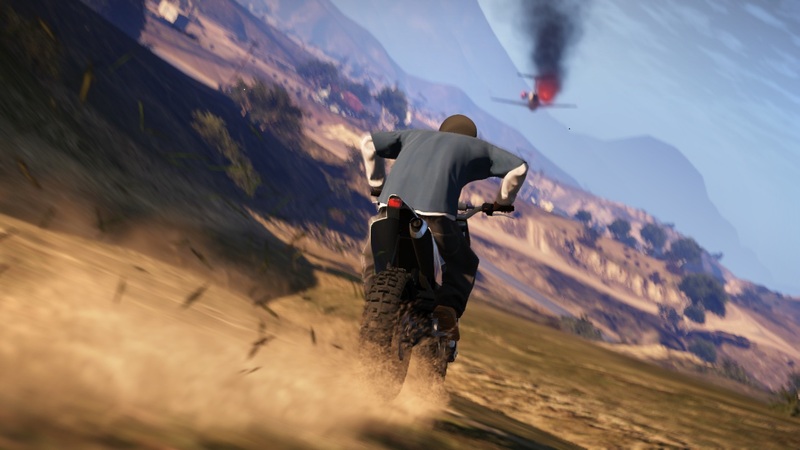 See all the GTA V screenshots in our gallery. As mentioned the other day, today marks the beginning of online previews being published by various gaming websites around the world. We're also lucky to have some new, and some unwatermarked screenshots from the GI preview to add to our gallery. Most of the previews posted so far are from European websites, but we've learned of a few new details so far. Also note that IGN will be starting their blowout week later today so we may get even more info later on. UPDATE: IGN's Preview is now up. 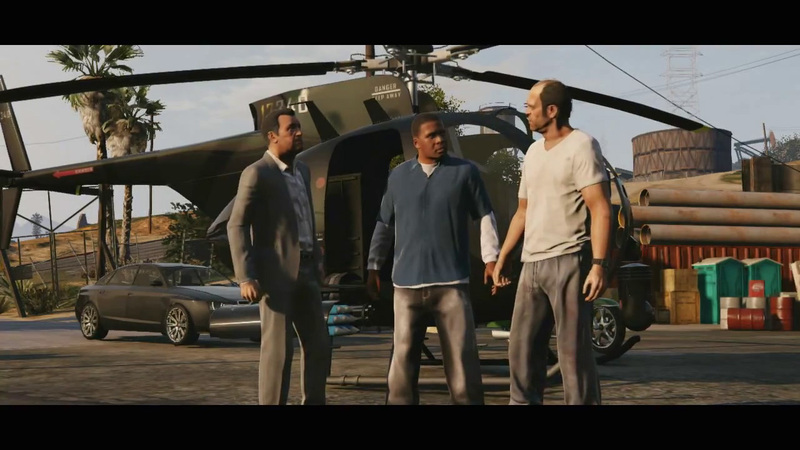 Side-missions like taxi, ambulance, vigilante missions will be back but may not be exactly like in previous games, but they will have "odd jobs to do"
Trevor is the skilled helicopter pilot, Franklin the skilled driver, while Michael is a "smooth operator"
Missions vary between "big and small events, explosive, infiltration, super spectacular, family, invasion, hostage recovery, heists and robberies. 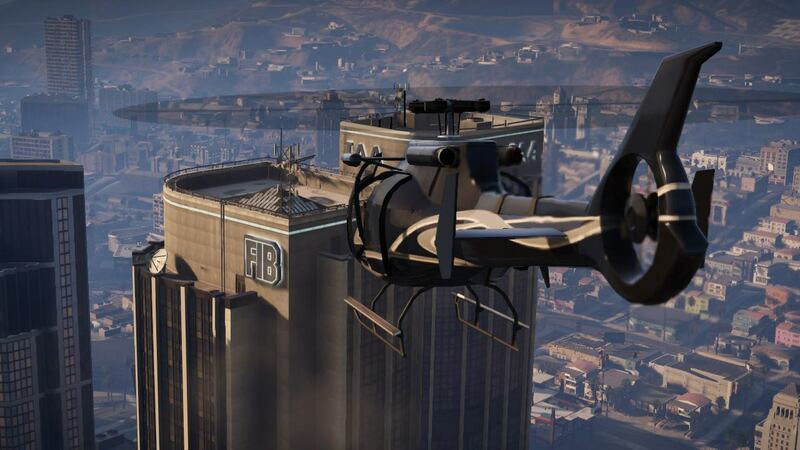 Plus classic GTA missions that have been updated an improved." 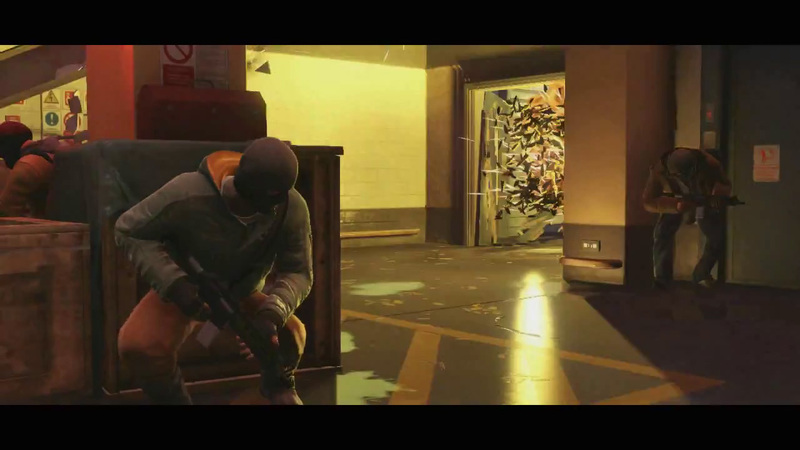 The mechanics behind the covering system have been greatly improved and will be important to gameplay. 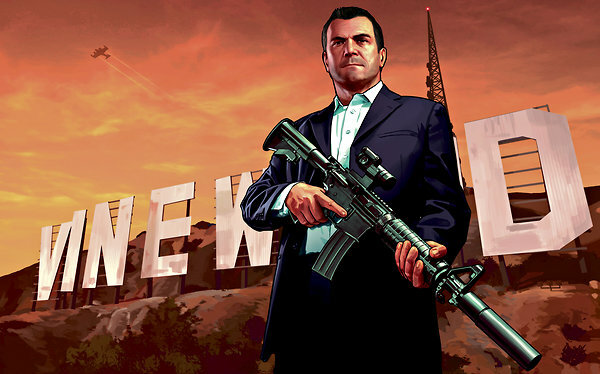 Regarding the game's economy, Dan Houser said "You will be able to spend money to buy interesting and fun things like expensive toys. We are still working on the economy but it will be a strong element in the game and players will be eager to make money to spend money. Something along the lines of 'I went through all of this to make all this money and now I'm going to spend it on this crazy item'". No co-op on single player missions but there will be in multiplayer. An increased focus on multiplayer with a lot more content. There is a functioning ecosystem teeming with wildlife. was heard playing on the in-game radio. 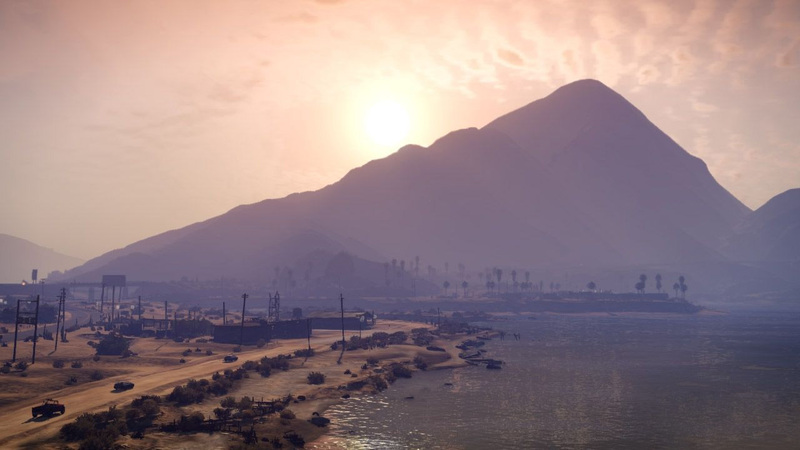 The name of the Salton Sea like area in the game is called Alamo Sea. There is a radial menu to select the 3 protagonists. In some missions, character switching is partially scripted - meaning it will happen automatically. 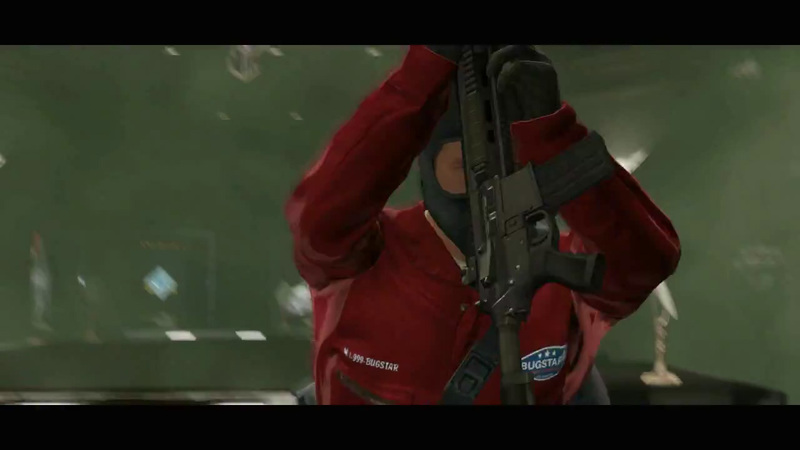 In the final part of a mission journalists saw in the demo, the player was able to decide which character to use. 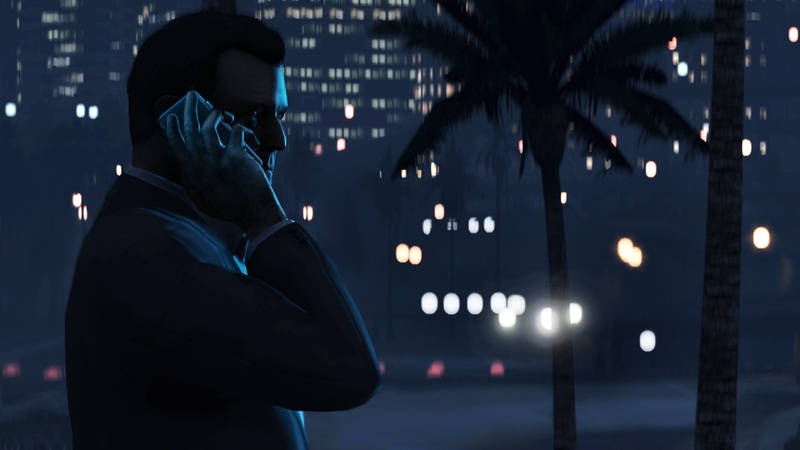 There are multiple different endings to the storyline, these depend on choices you make throughout the game. The majority of the map will be open from beginning, with the exception of a few protected areas. 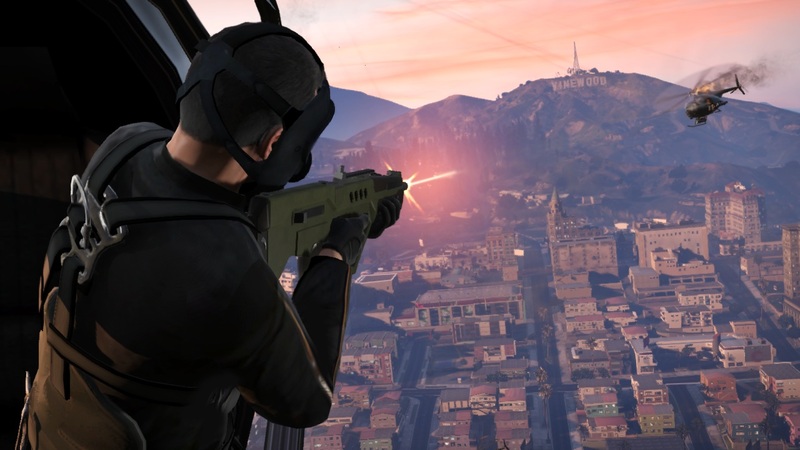 A certain amount of money will be needed to gain access to some missions. Some of these screenshots have been seen before, but we now have unwatermarked versions! 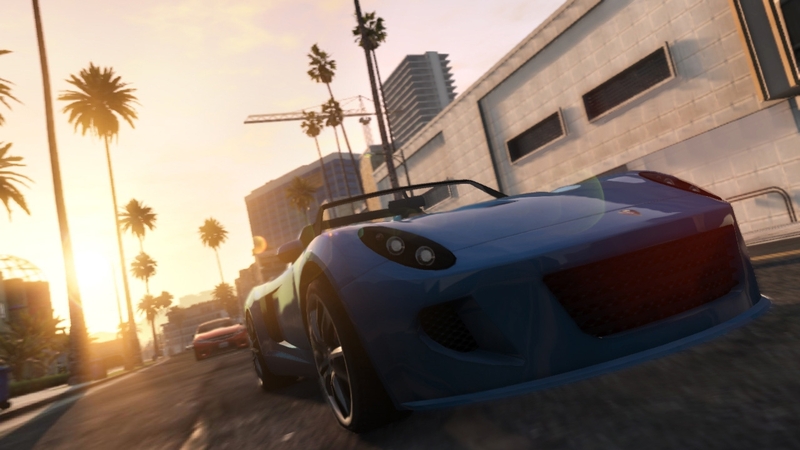 See all these and more in our GTA V screenshot gallery. We now have unwatermarked and extended versions of some of the recent artworks. 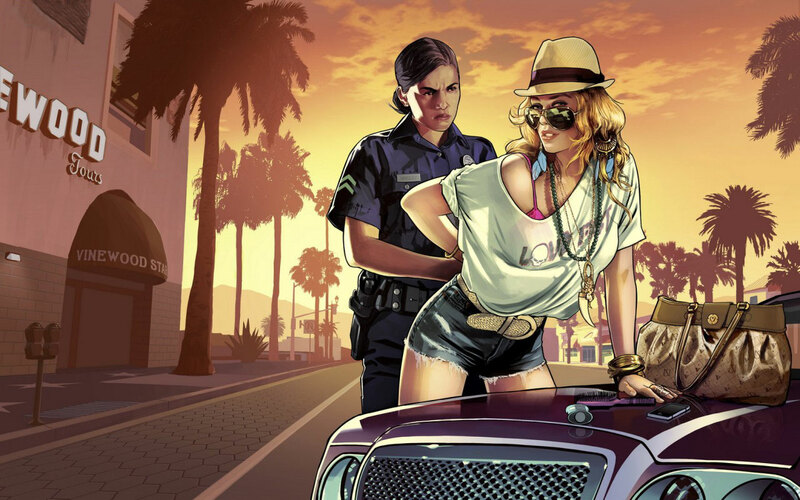 See all these and more in our GTA V artwork gallery. 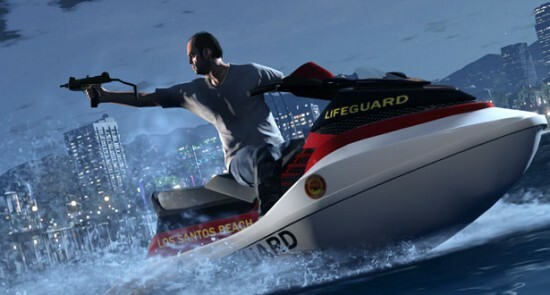 Rockstar VP of Creative Dan Houser sat down with The New York Times for a little Q&A session recently, the article doesn't talk so much about GTA V but nonetheless is a pretty interesting read regarding how Dan works and what he and Rockstar want from their games. Obviously, we want them to be entertained. We want them to be stimulated, questioned, amused, all of the other higher and lower things one gets from entertainment. We have a vision for what we think interactive entertainment can become, and each time we get closer to realizing those ambitions. Asked about how certain TV shows have tried to capture the feel of a city, Dan revealed that he doesn't even watch TV, preferring to avoid it for "professional reasons". I haven�t seen �Treme.� I never even saw �The Wire.� One of my weird disciplines is that I don�t really watch a lot of those shows, if they relate to what we do. I only watched a tiny bit of �The Sopranos.� No �Boardwalk Empire.� No �Breaking Bad.� Wherever it�s too close to crime, gangster, underbelly fiction, and it�s supercontemporary, I decided, for professional reasons, I have to avoid it. We are editing, fixing, removing, replacing, adding, avidly. It�s the equivalent of, if you wrote a book, and you had two million spelling mistakes. And you had to do them by hand, in a language you didn�t understand. Head on over to NYTimes to read the full interview. 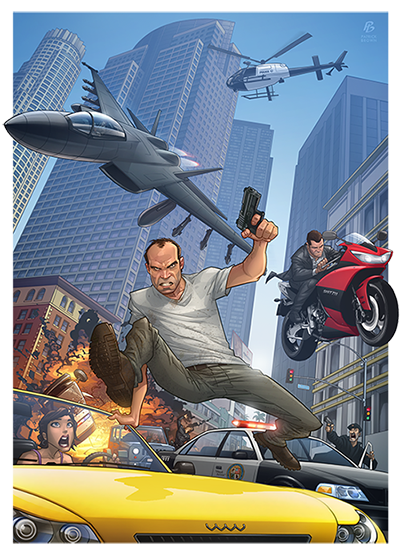 Also remember that on Monday we should have a few more online previews of GTA V which might give us a little more info, while the GI exclusive was very thorough, they didn't necessarily cover every single detail they saw. Of course the big thing you're all currently waiting for is the release of the second trailer on the 14th November, there's a countdown to that on our homepage. 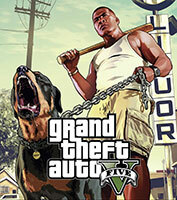 Game Informer's World Exclusive GTA V Preview! 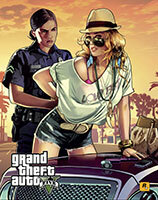 Following on from the cover reveal earlier, the digital version of this month's Game Informer magazine is out now. Below is our summary of the massive amount of information covered in the magazine. 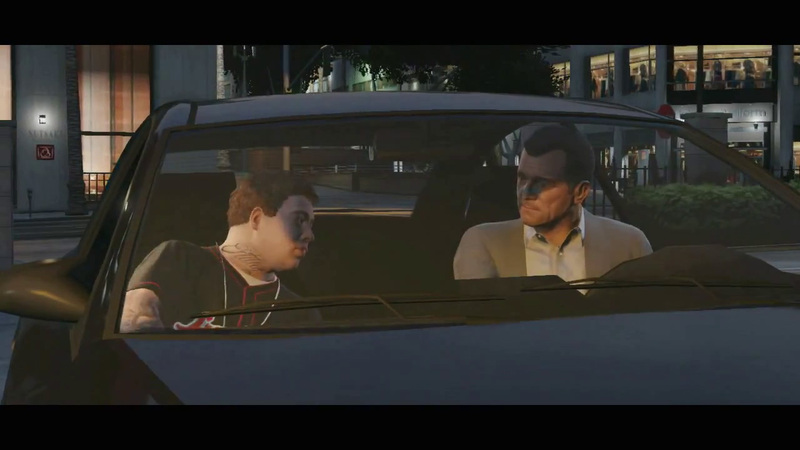 Trevor is a friend of Michael's. He lives in a trailer in a desert region of the map. He is a war veteran and has flight experience. When not in control of a character, they will be going about their daily business - you are free to switch between them at nearly any time you want. 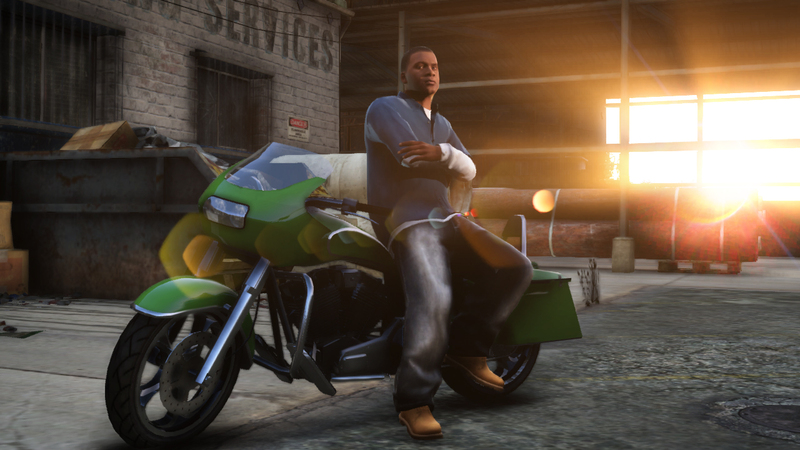 "Within the story, you're going to know information about a character before they know it because you're going to know what the other people know when you play as them"
Some familiar faces from GTA IV and EFLC will make a return, though not major ones like Niko. Includes: beachfronts, wine country, large wilderness area, fully explorable Mt. 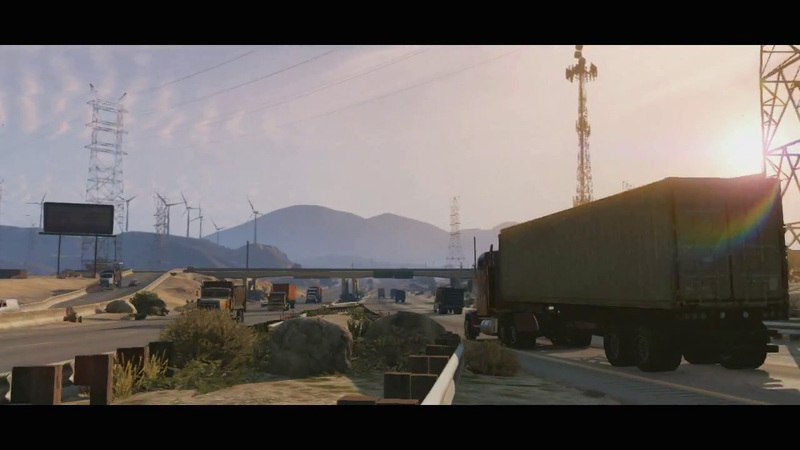 Chiliad, Salton Sea region, military base, sprawling suburban hills, and bustling urban centre. The ocean is fully explorable, including being able to dive. 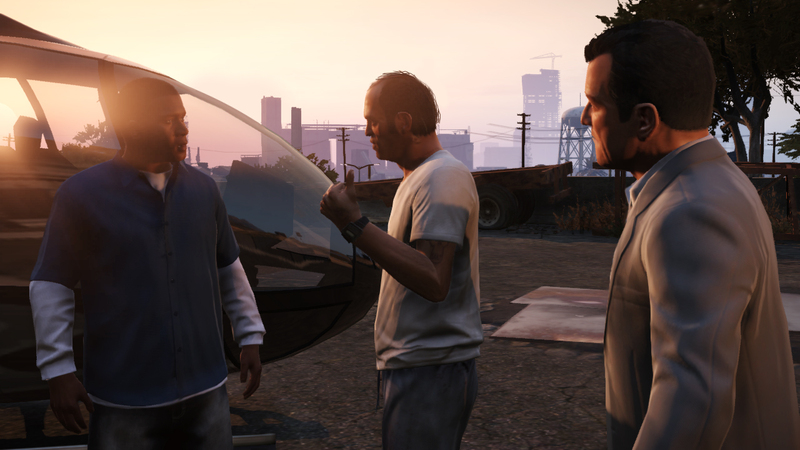 Michael, Trevor and Franklin could have some hobbies only available to them - although most minigames will be available to all three characters. The mobile phone concept makes a return, but friends won't annoy you by calling all the time! You'll be able to access the Internet with it. 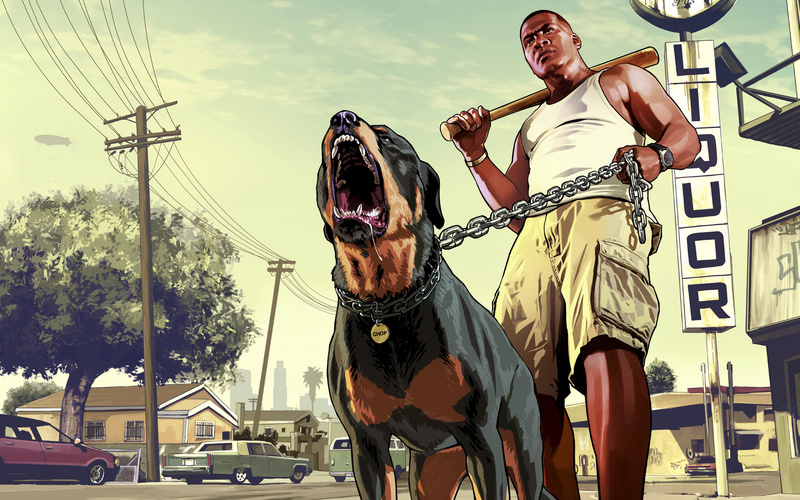 Census information and vehicle sales data were used as a guide to depict the game world. We know it's a lot to take in! But you can share your thoughts in the forums. 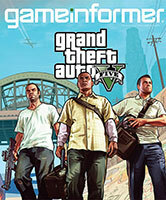 Here it is, Game Informer's cover revealed for the world exclusive GTA V preview which will be out in just a few more hours. 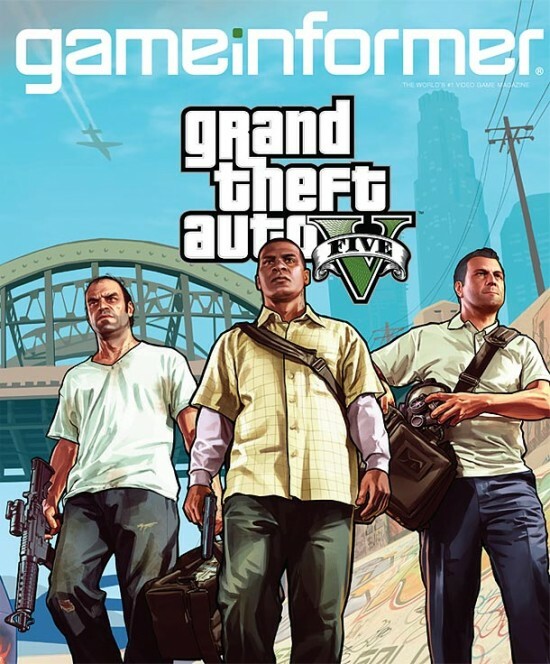 The cover shows THREE main characters, all of which have been seen in various artwork and screenshots so far. The long wait is over at last. 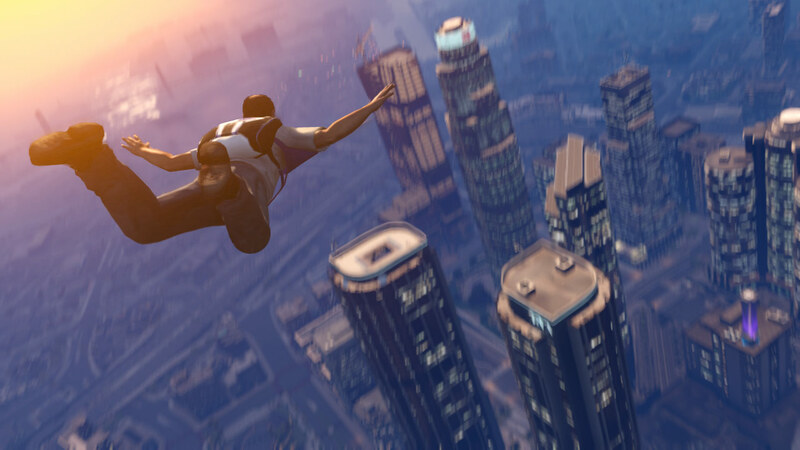 With the December issue, Grand Theft Auto V fans can pore over every detail we could get about Rockstar Games' highly anticipated sequel. Over the course of 18 pages (our biggest cover story yet! 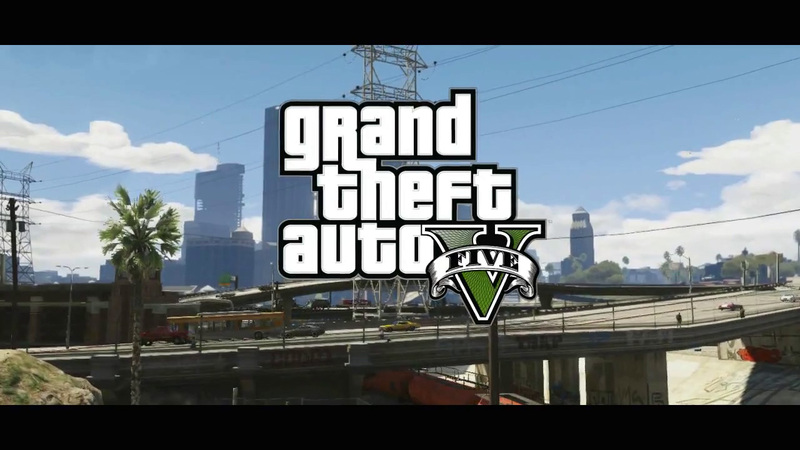 ), we introduce the three main protagonists, discuss the groundbreaking way you use them, and explore the reimagined Los Santos � the biggest open world Rockstar has created to date. The massive feature also divulges and dissects many more aspects of the game fans won't want to miss. In a few hours from posting this we'll have a full summary continually updated as we find more information from the issue. Keep checking back as we don't have an exact time for the release, but we do know it will contain a massive 18 pages worth of information! UPDATE: Game Informer have added a GTA V Hub ready for future articles on the game, currently this only features this cover reveal. Of interest is the hub's background image which features one of the protagonists. Tell us what you initial thoughts are about having three protagonists in our forums. Look out for more online previews appearing next week. Some gaming websites are starting to inform their readers, in particular, two tweets from a pair of Dutch websites say they'll have previews up on Monday, 12th November. 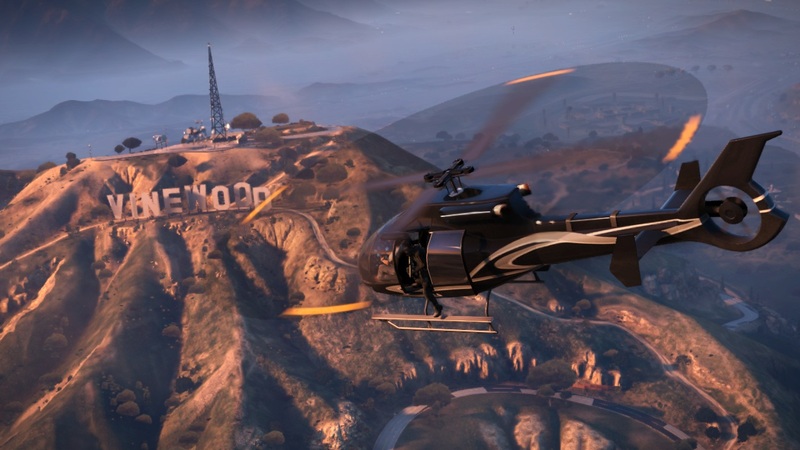 InsideGamer heeft de kans gekregen om exclusief GTA 5 te checken in New York. Lees vanaf 12 november alles over deze topgame van 2013 op IG! 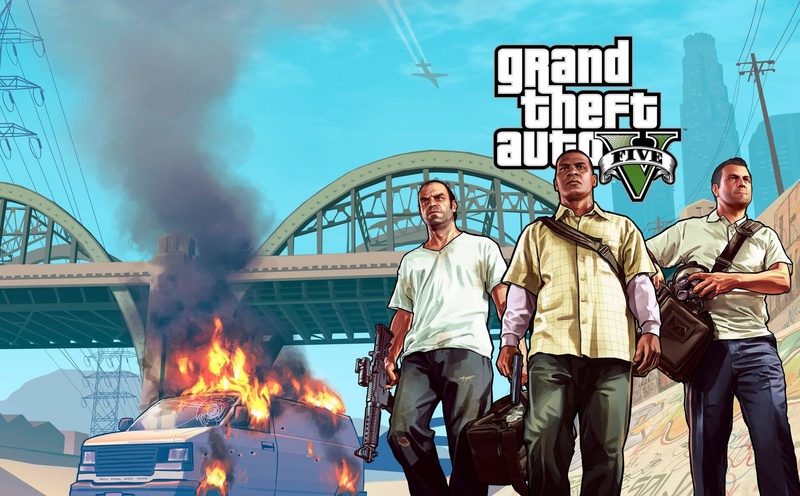 GTA V. We hebben 'm in actie gezien. En erover gesproken met de makers. 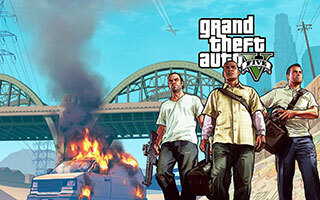 Lees 12 november alles over de nieuwe Grand Theft Auto op Gamer.nl. 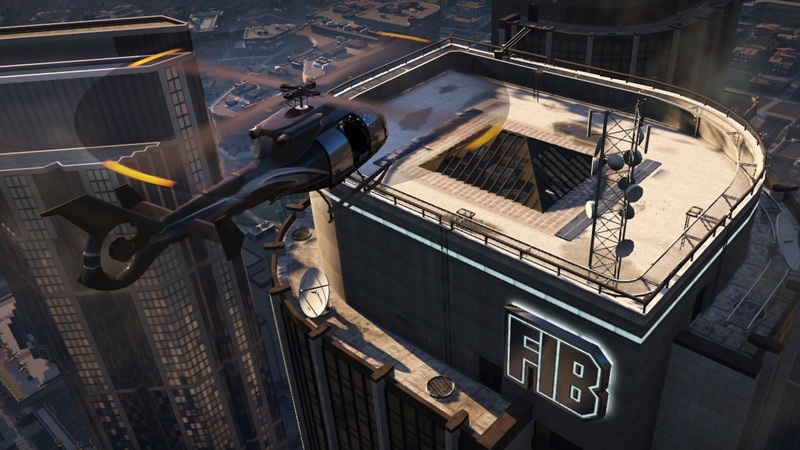 Both publications say they were able to see the game in New York and speak to developers. 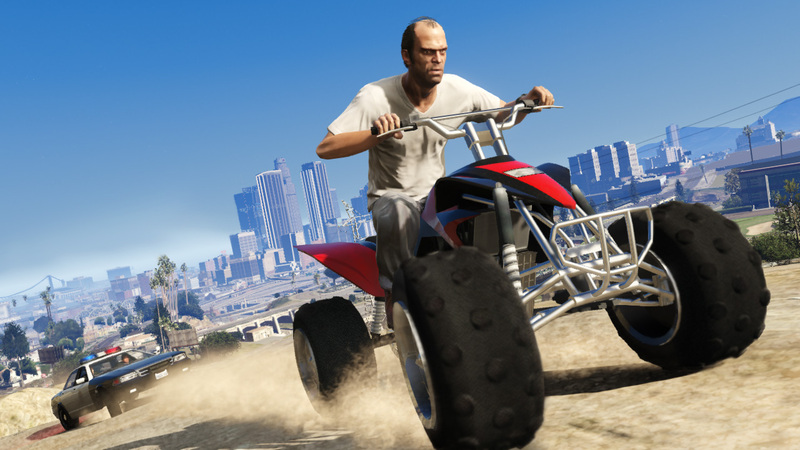 We'll have summaries from all previews we find, in English, right here on The GTA Place. Stay tuned. 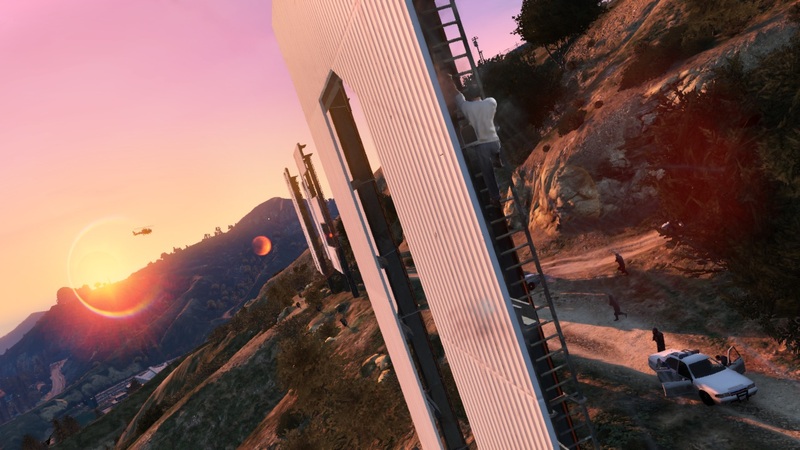 A GTAForums user has discovered a new GTA V screenshot on UK magazine Short List's website, where it is being used to promote a competition to win one of the photo viewers that have recently been given out by various US retailers. This is the first we've heard of the photo viewers being available outside the US so keep an eye out for more news regarding them. 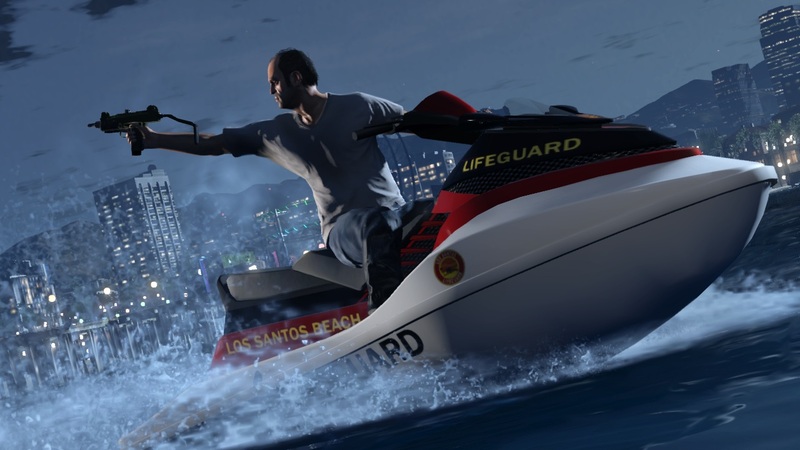 The image features a character (possibly the man in the quad bike artwork) riding a jet ski. 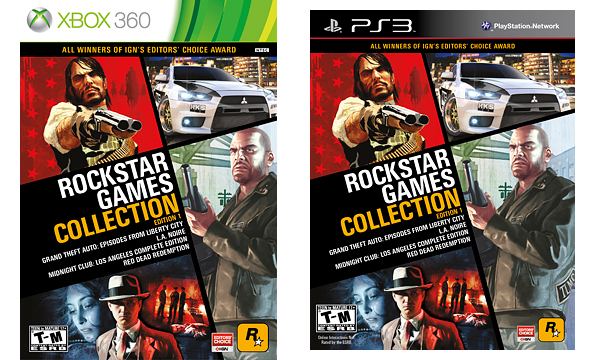 As we reported on last month, today marks the release of Rockstar Games Collection Edition 1 in North America for Xbox 360 and PlayStation 3. The collection retails for .99, and features four critically acclaimed, best-selling Rockstar titles, including Red Dead Redemption, Grand Theft Auto: Episodes from Liberty City, L.A. Noire and Midnight Club: Los Angeles Complete Edition. There is currently no word on whether or not this collection will be released in any other regions around the world, or indeed on any further collections - at least the "edition 1" part of the title implies there will be more to come in the future. 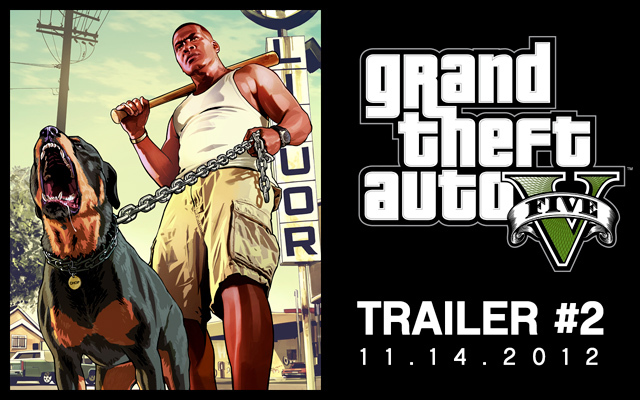 GTA V Trailer #2 Coming Next Week, Wednesday 14th November! 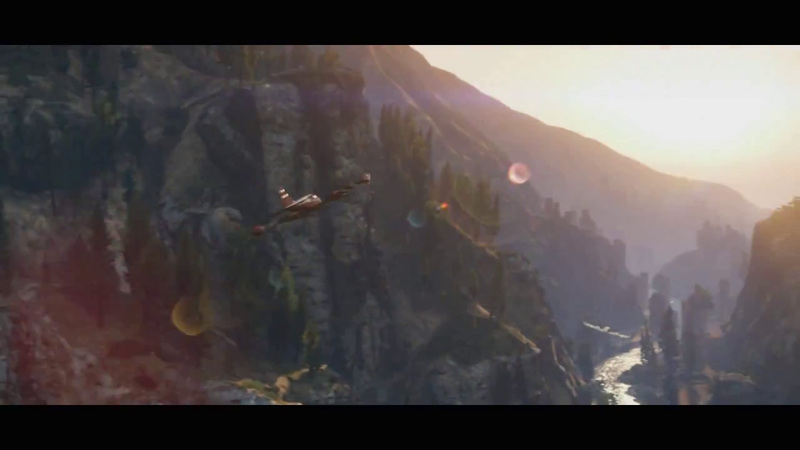 Rockstar have finally announced the release date for the second GTA V trailer! Our countdown timer is now live on the homepage. What are you hoping to see in the trailer? 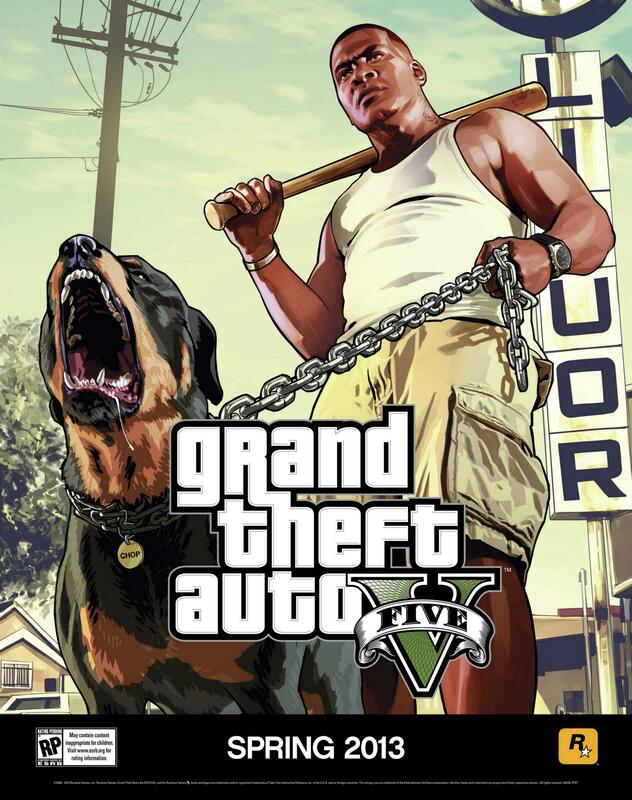 Rockstar have just announced that Grand Theft Auto V is now officially available for pre-order from various websites and stores. 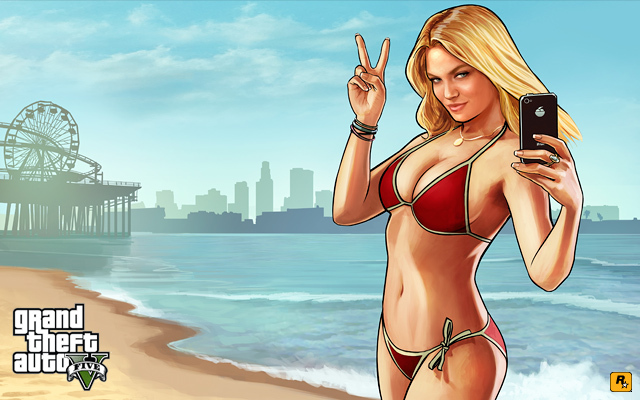 Additionally, Rockstar have made available an extended version of the "beach weather" artwork that was revealed a few days ago. Check that out in full below. 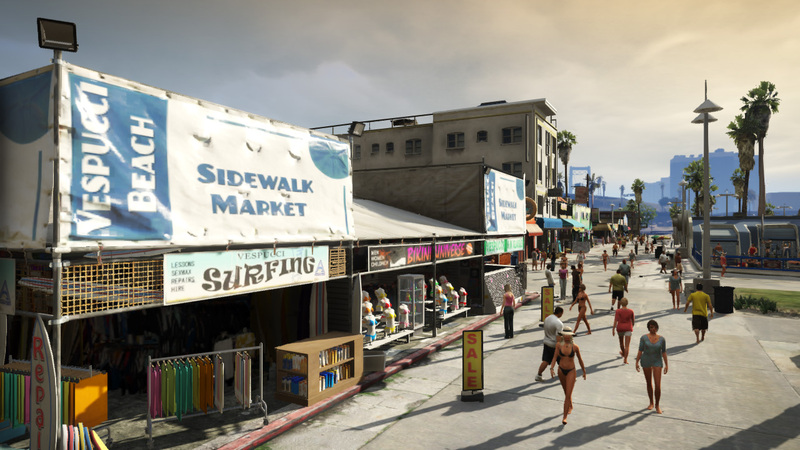 Rockstar have provided a list of links to British and North American retailers, noting that more international retailers will be added when they become available. 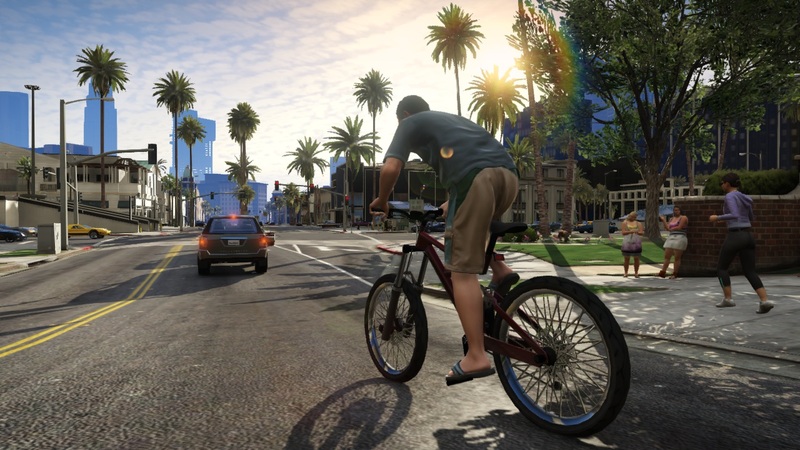 Finally, Rockstar have promised an update on progress of the second trailer soon. 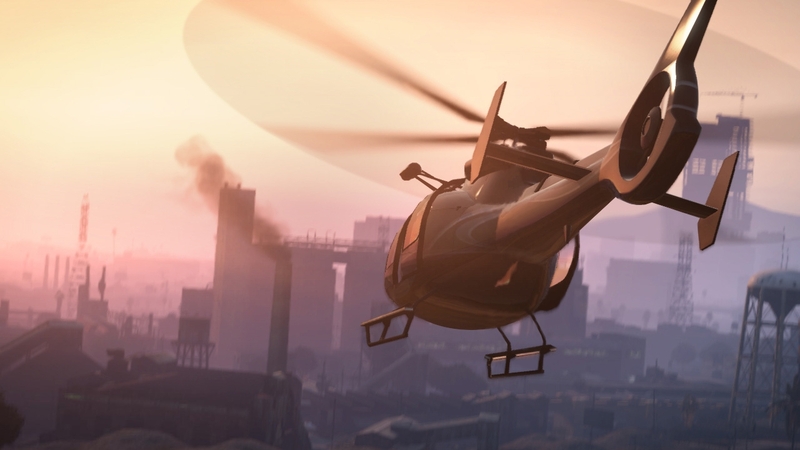 Keep an eye on The GTA Place for all the latest updates on that, you can follow us on Facebook, Twitter and Google+ if you aren't already. Ahead of their exclusive review, Game Informer have posted high-res versions of a couple of the new artworks we've been seeing from in-store promotional displays. 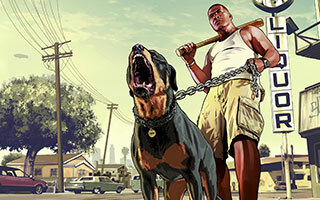 One shows the hispanic man from the trailer holding a dog called "Chop", while the other shows a female police officer arresting a lady whose wearing a Love Fist t-shirt. Love Fist were a fictional metal band that featured in Vice City for those of you who can't remember that far back! Check them out below. We've also updated our artwork page with these. Having trouble keeping up with all the news? Follow us on Facebook, Twitter, and Google+ for updates! 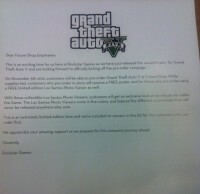 As GTA V becomes available for pre-order in just a few days (5th November), many stores across the world have received promotional materials for the game to hand out to customers. It seems some lucky people have managed to get their hands on some a little early. 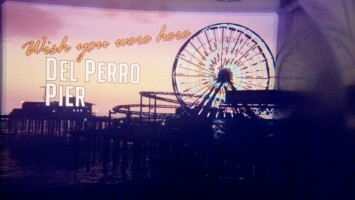 The main item currently getting a lot of attention is a small photo viewer that when looked through shows various locations, in fact, in a style not too dissimilar to the Vice City postcards some of you may have seen back in 2002. 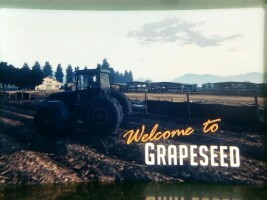 Various photos are being posted by members in a GTAForums thread, here are some pictures of the images inside it. These items are supposedly being given out on a first-come first-served basis to customers who preorder the game from stores across North America (no reports yet from anything elsewhere in the world).